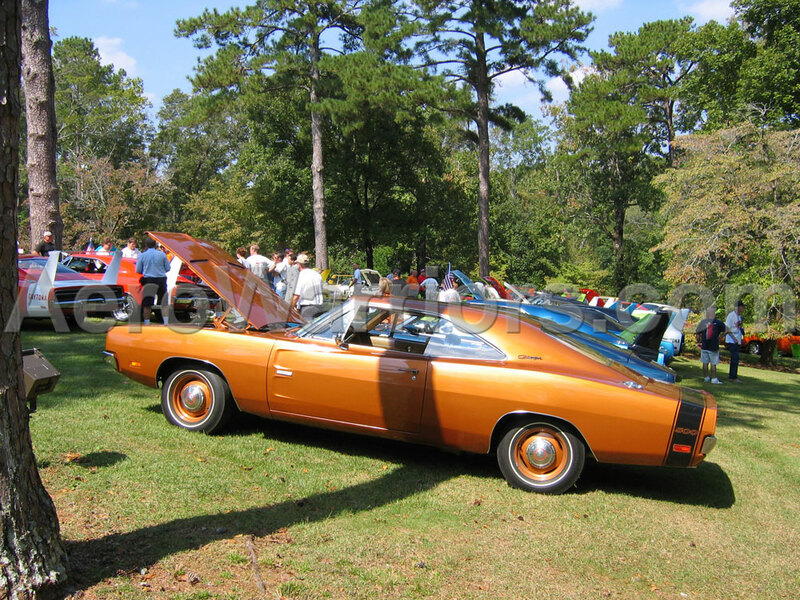 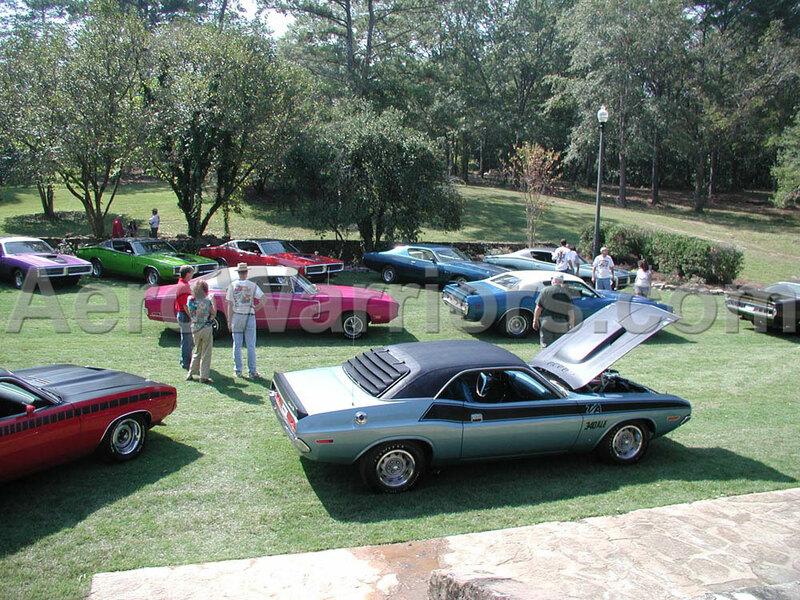 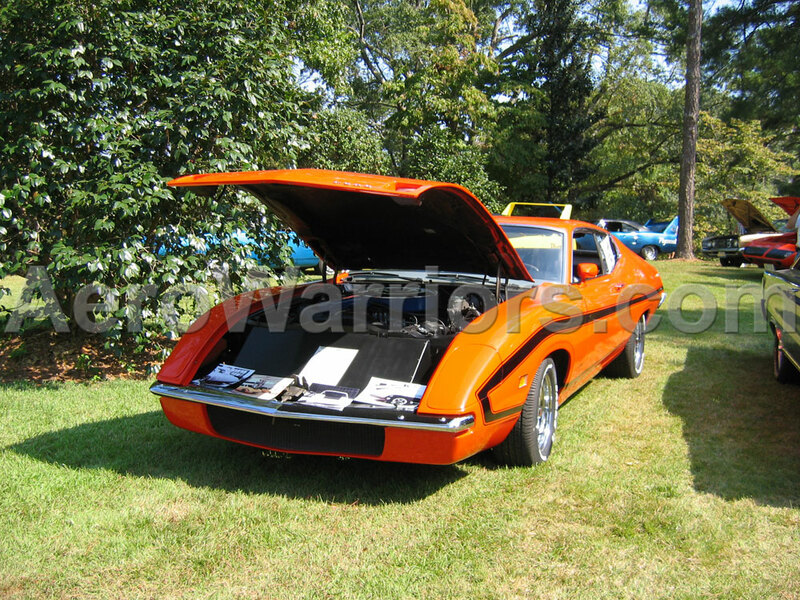 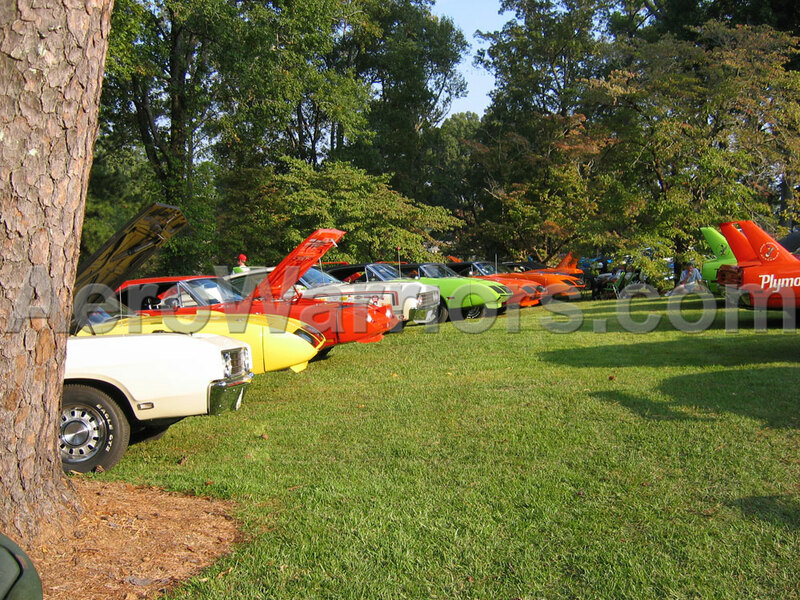 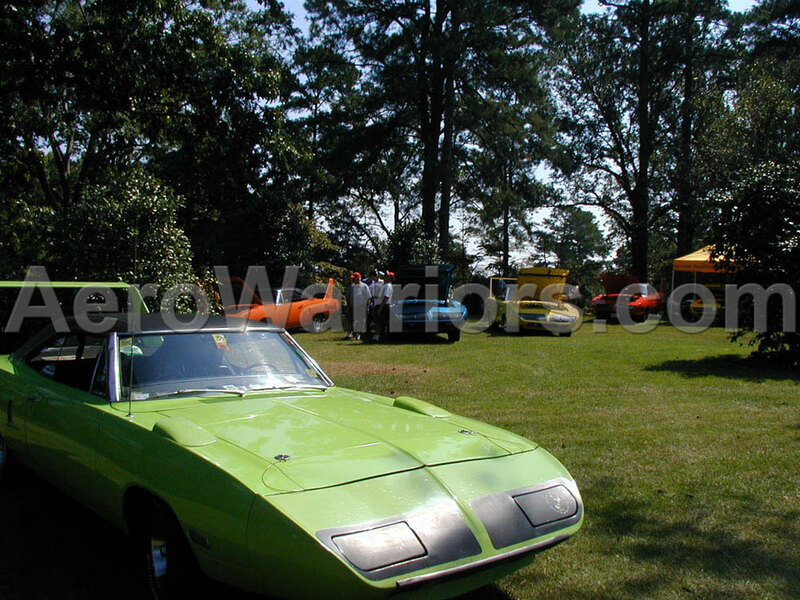 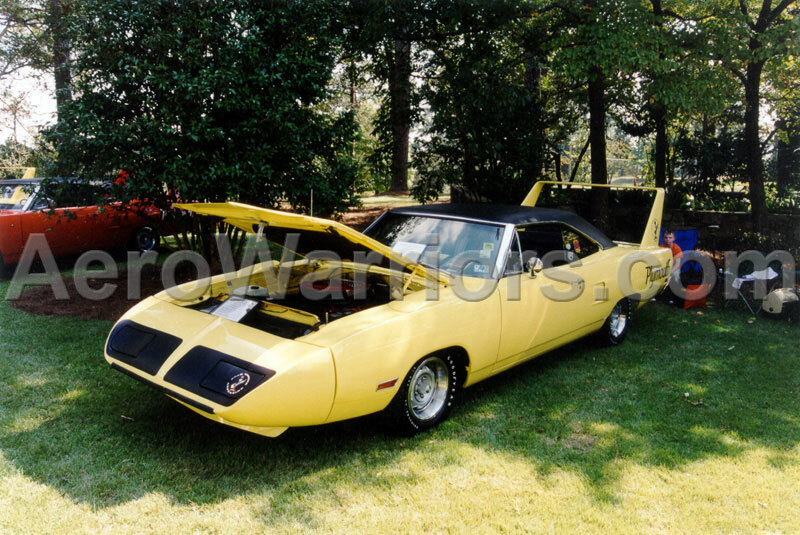 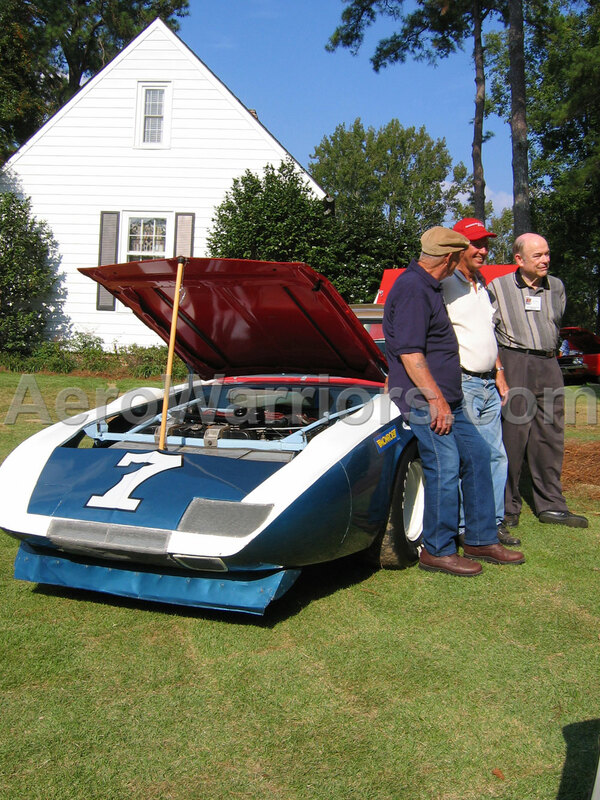 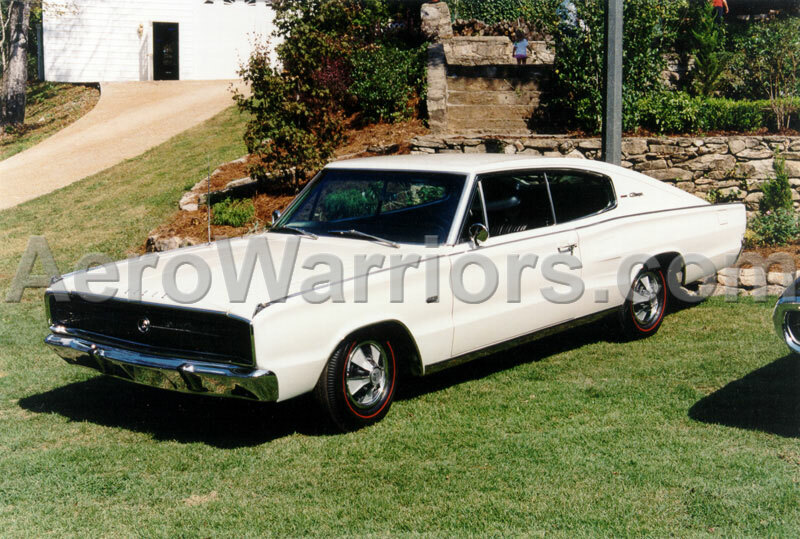 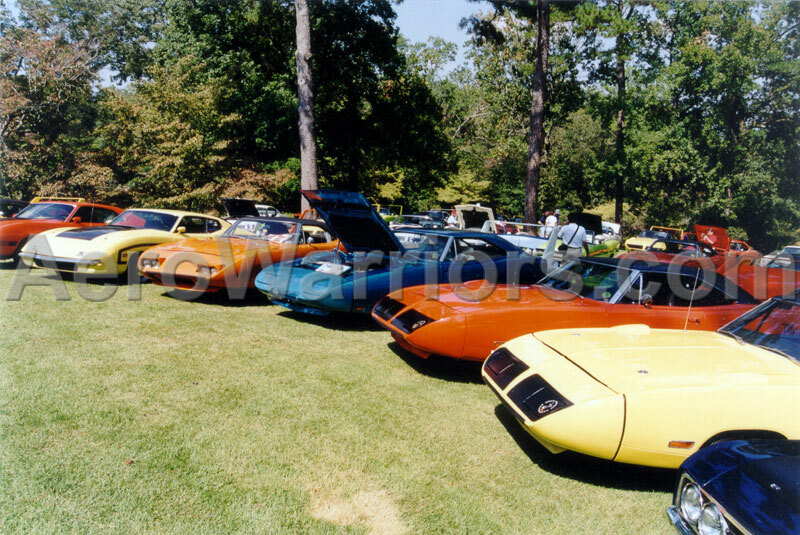 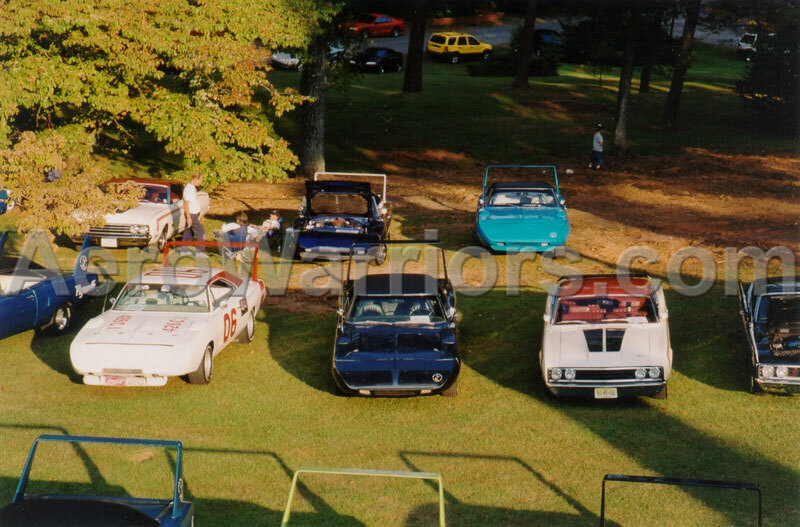 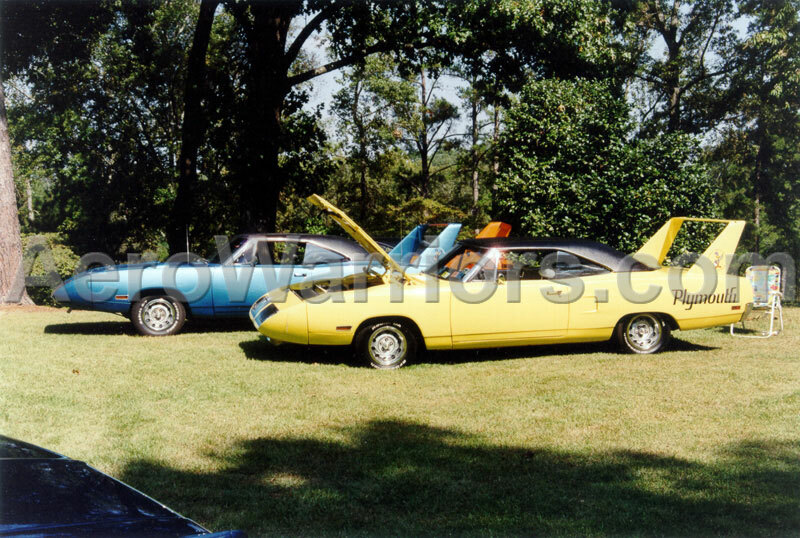 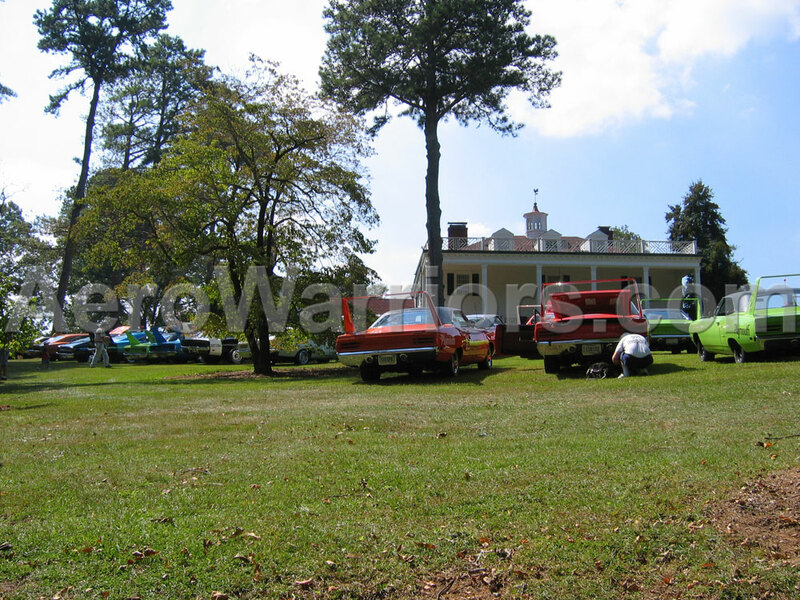 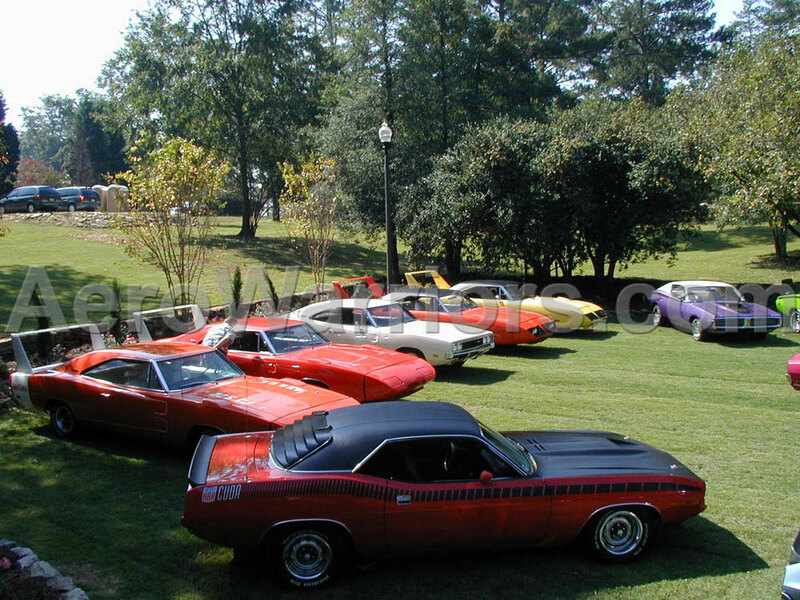 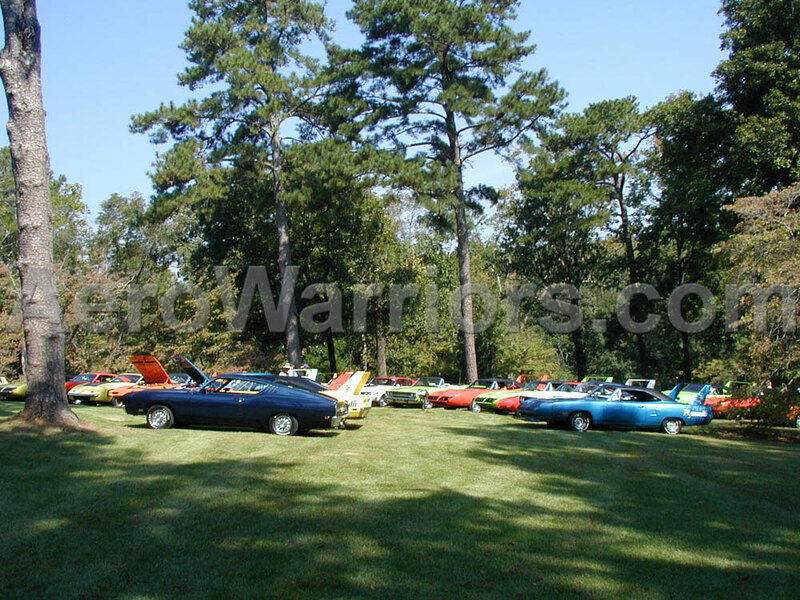 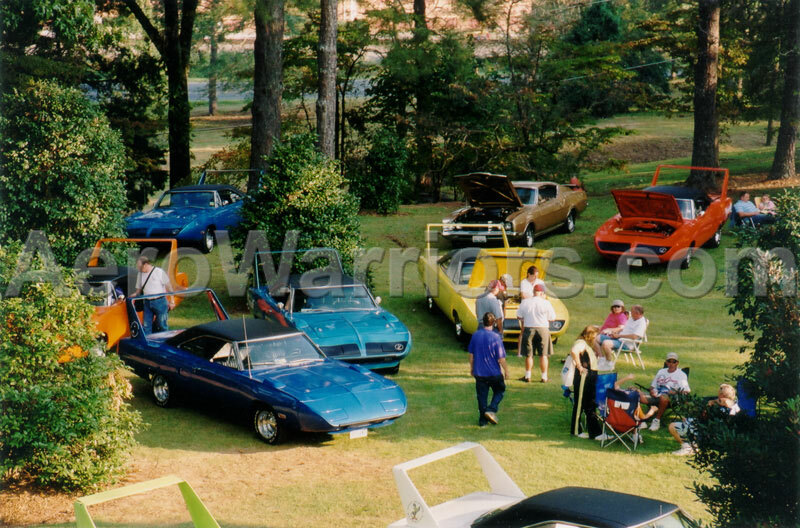 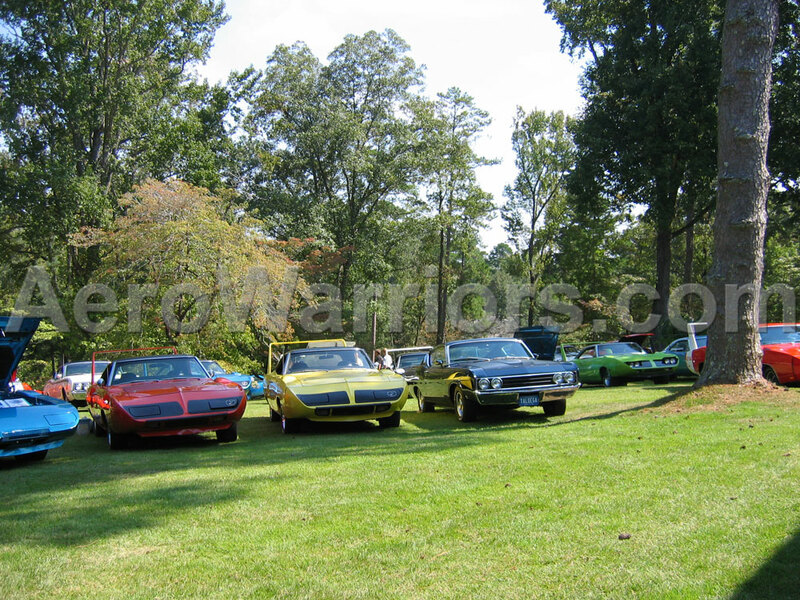 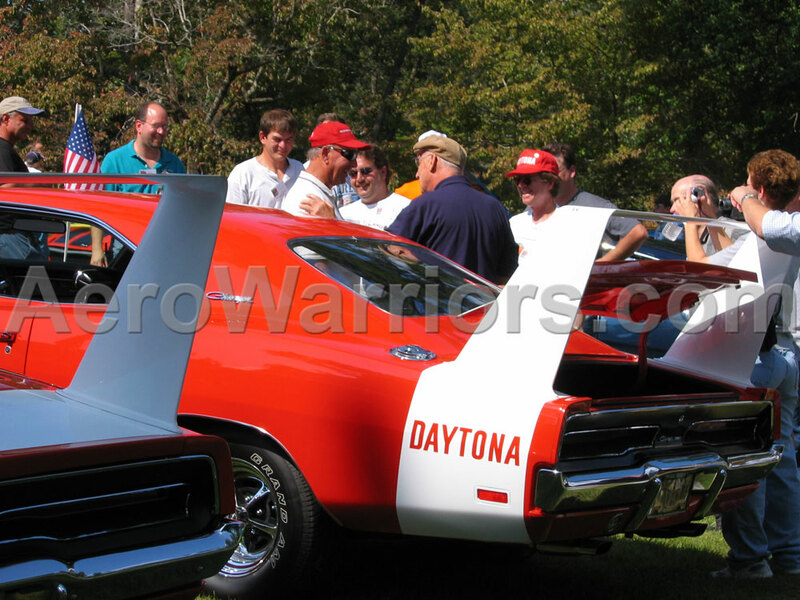 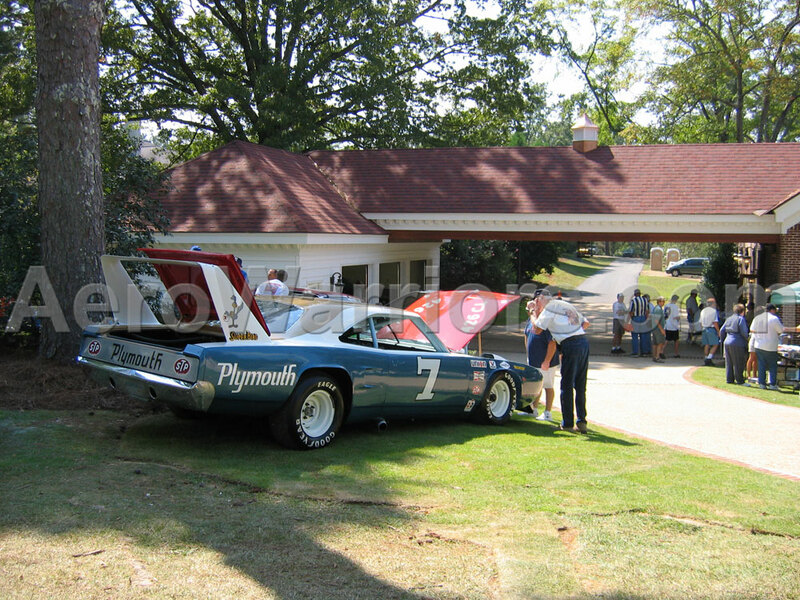 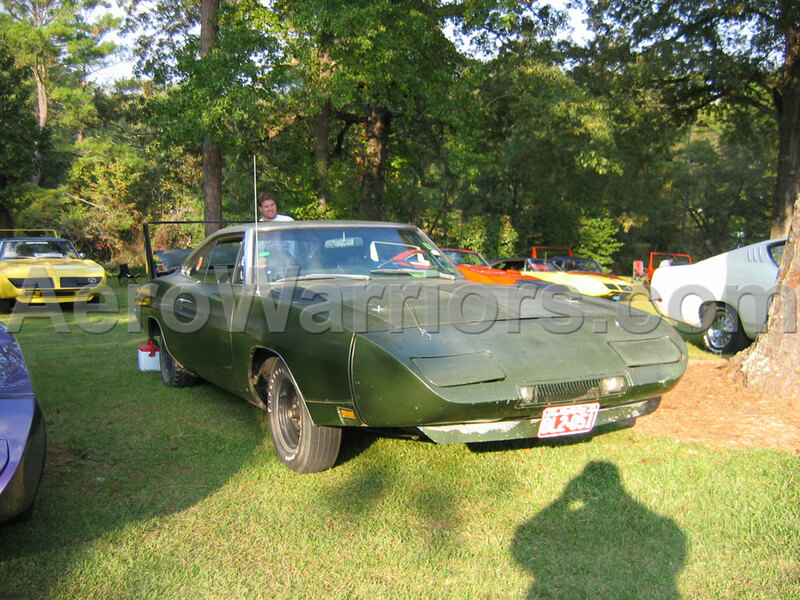 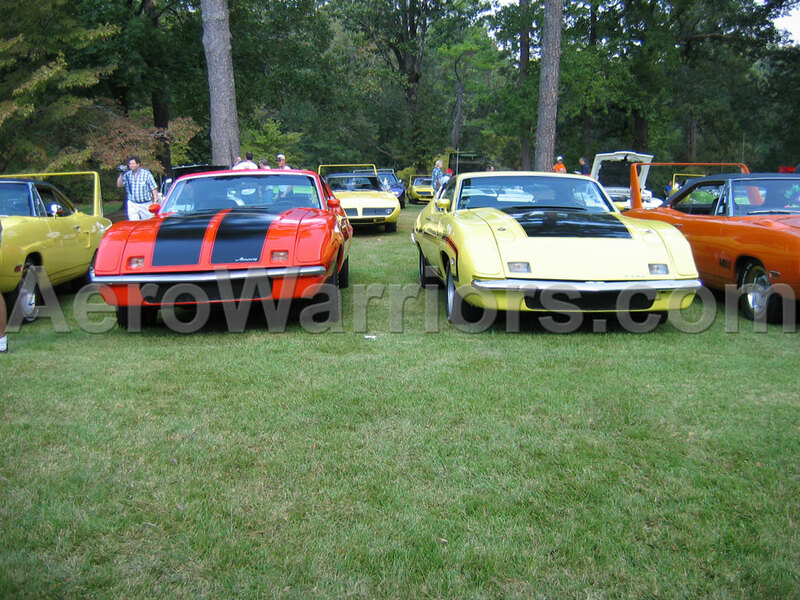 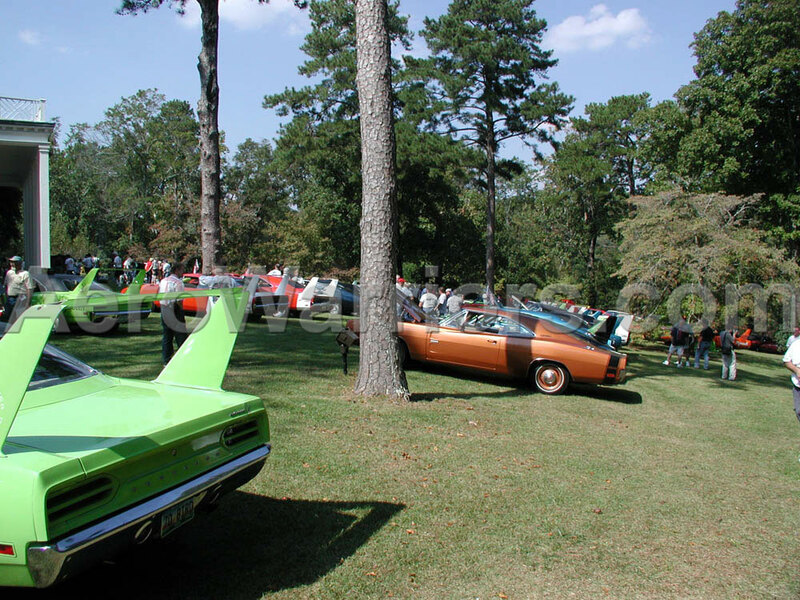 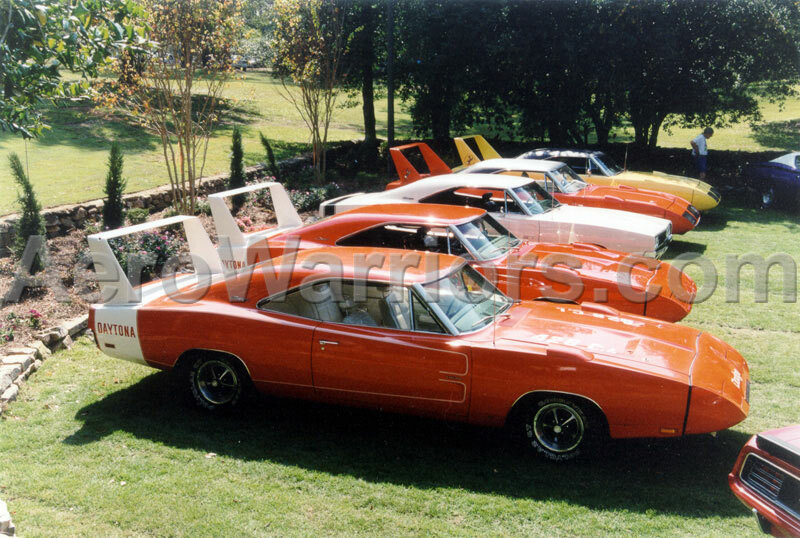 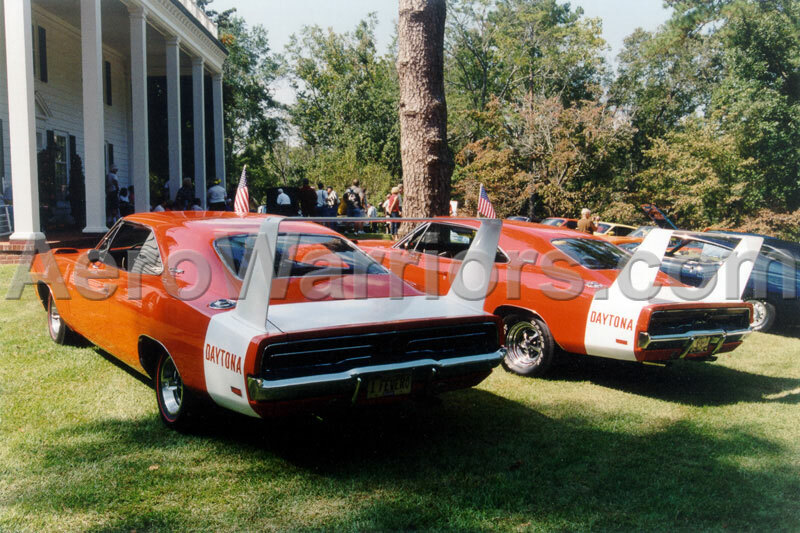 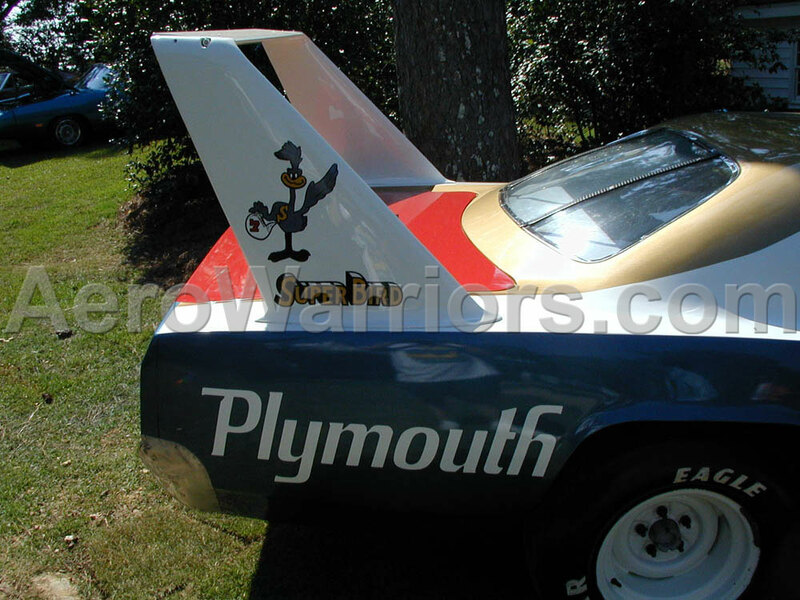 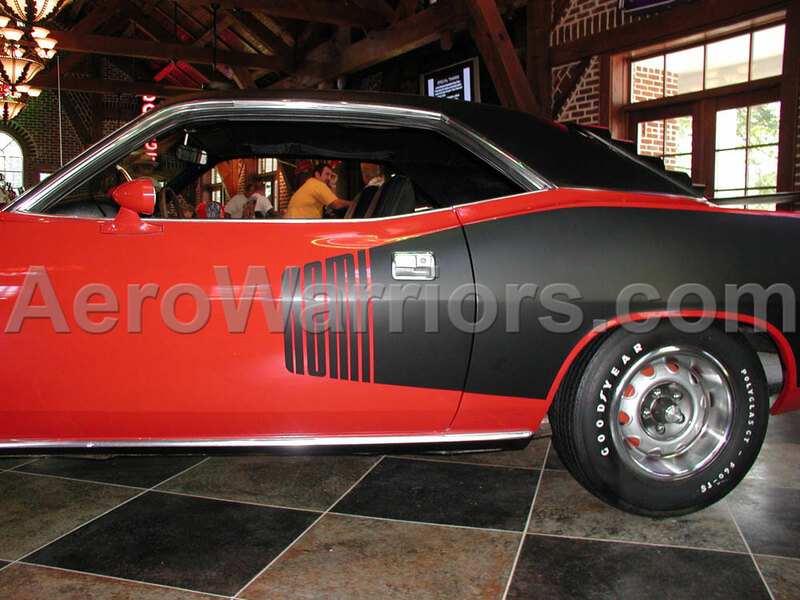 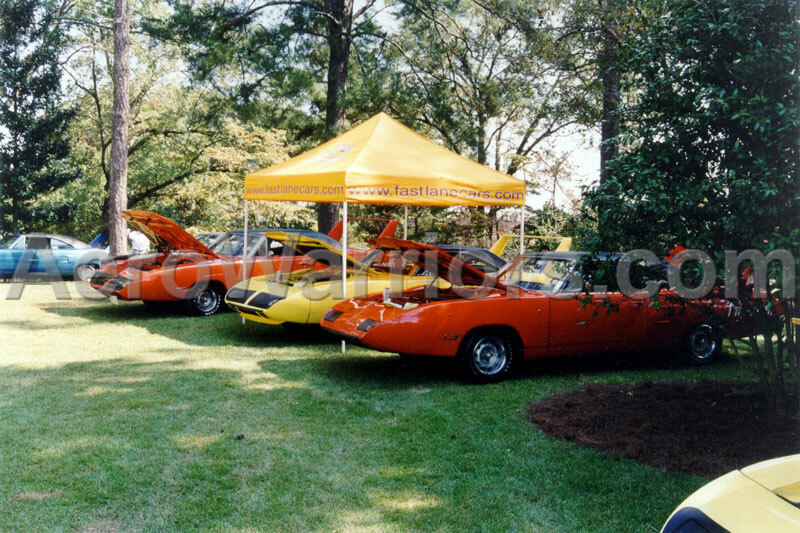 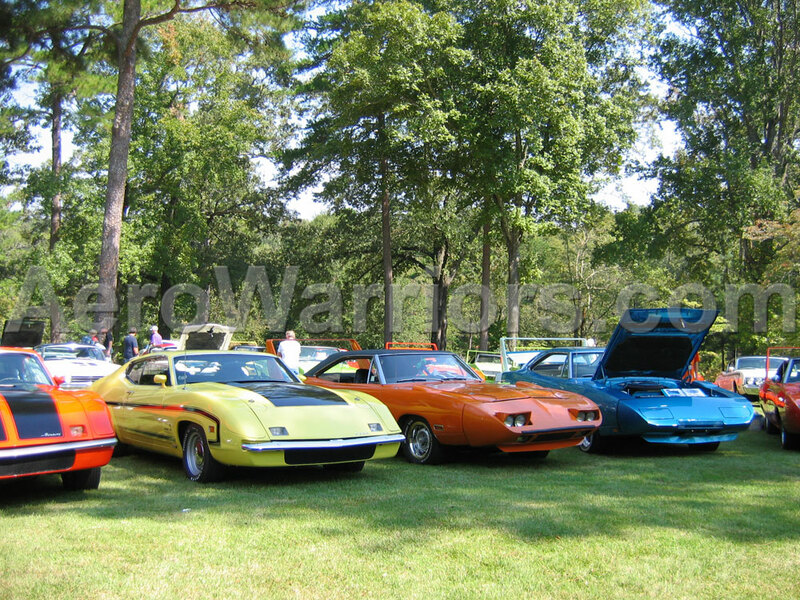 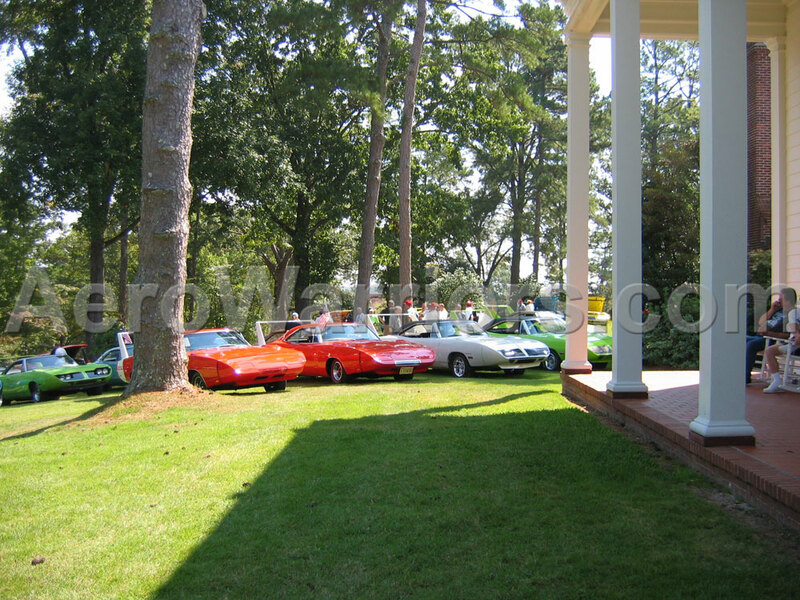 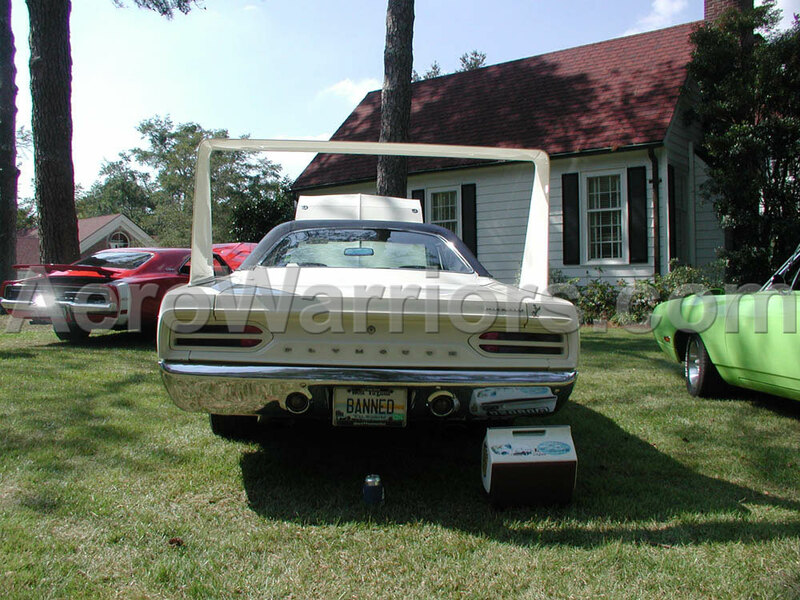 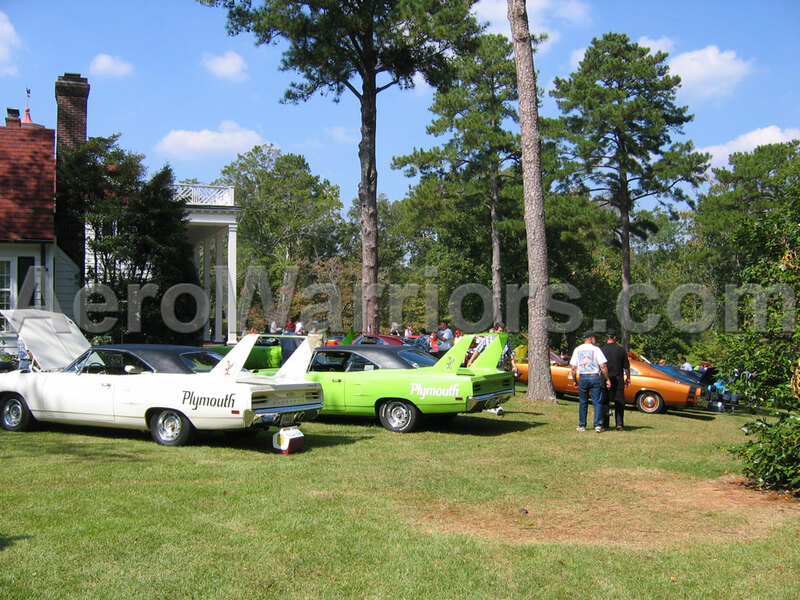 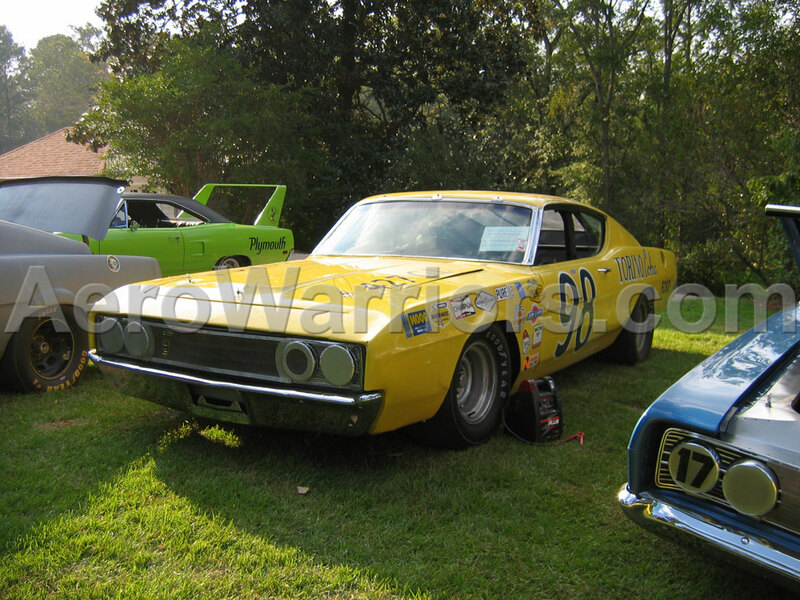 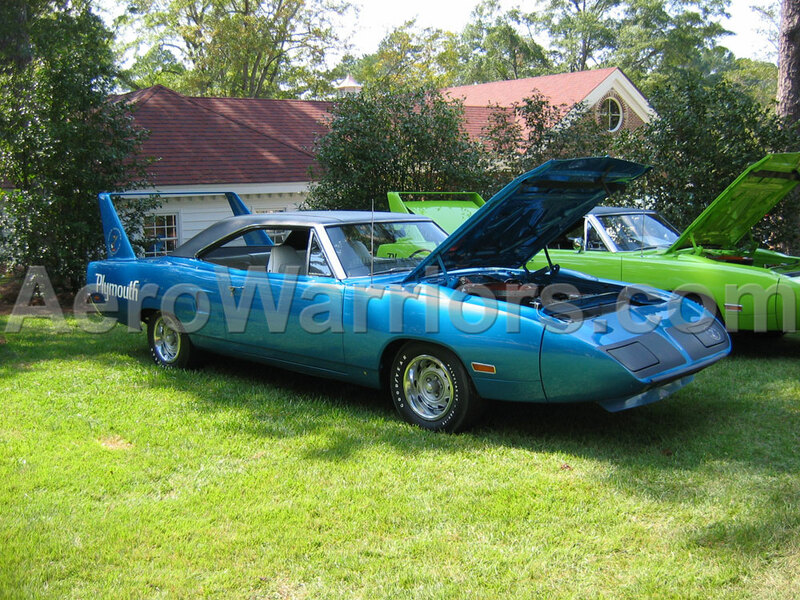 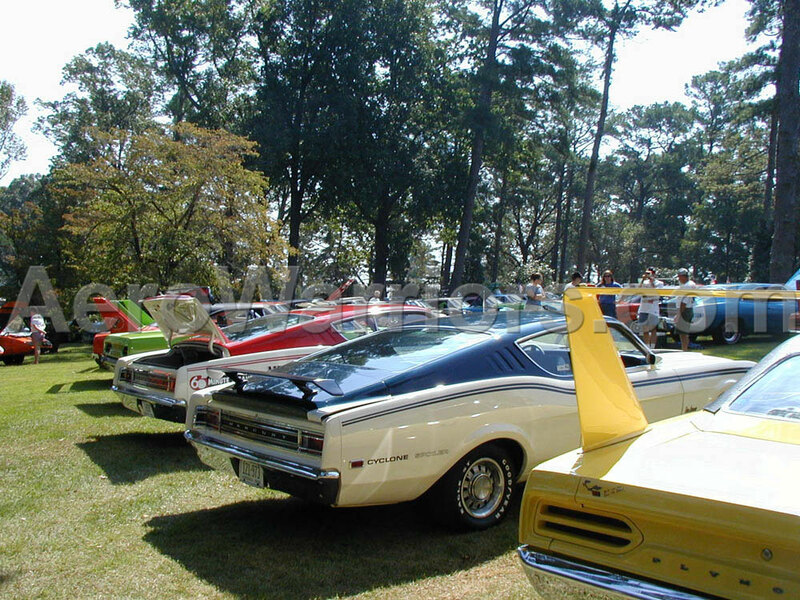 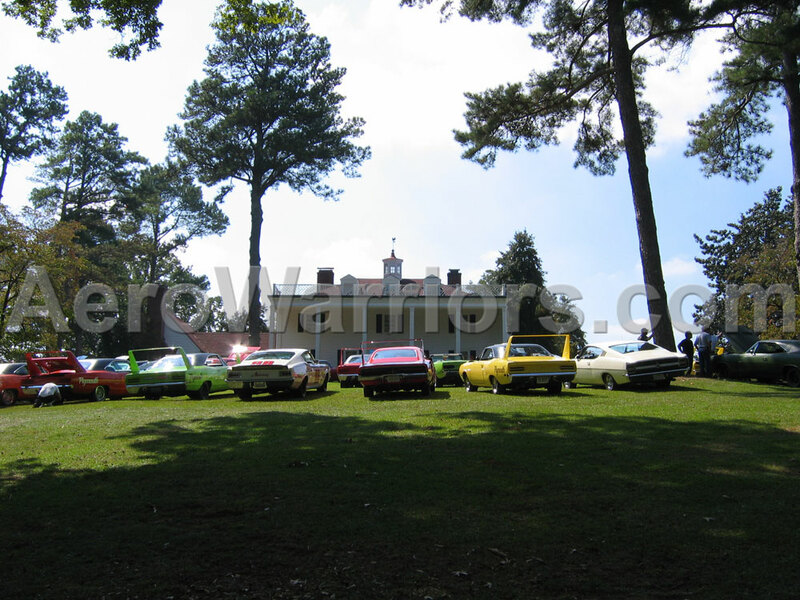 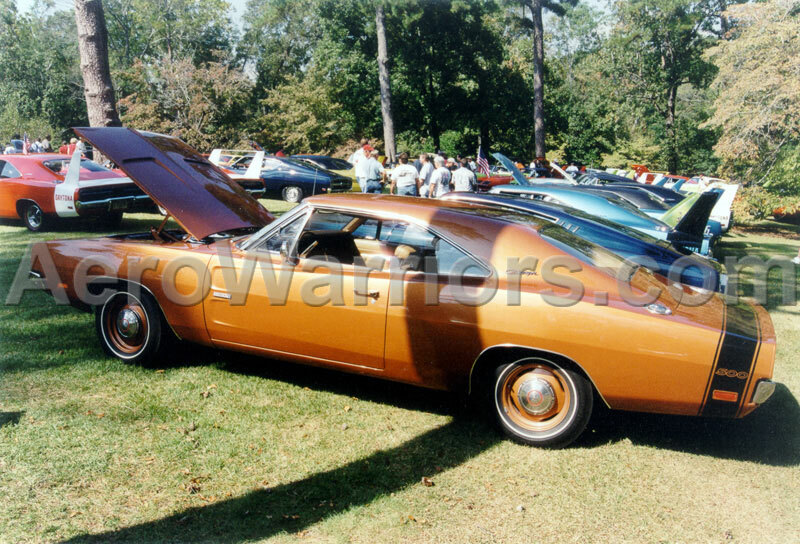 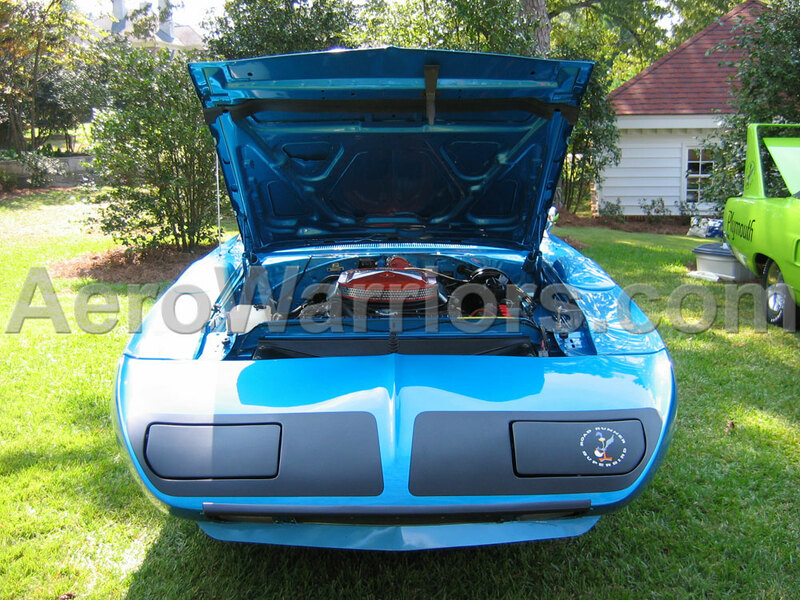 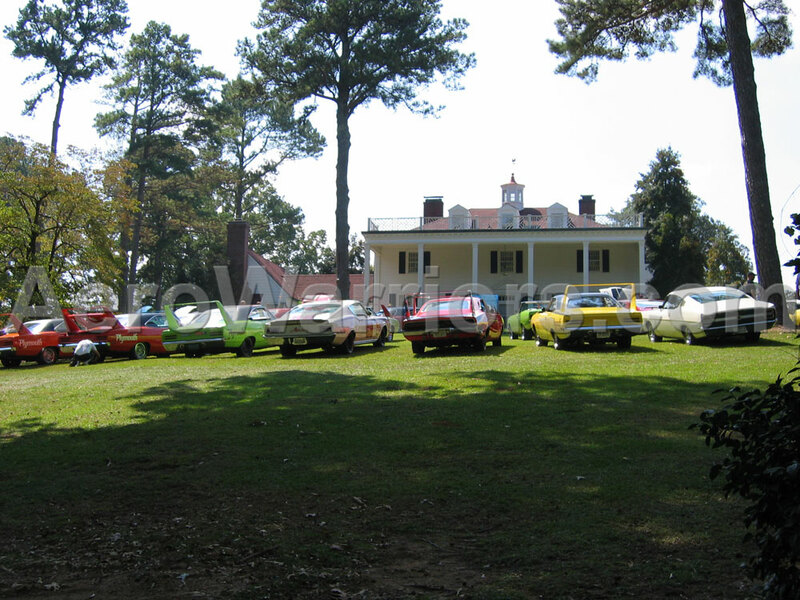 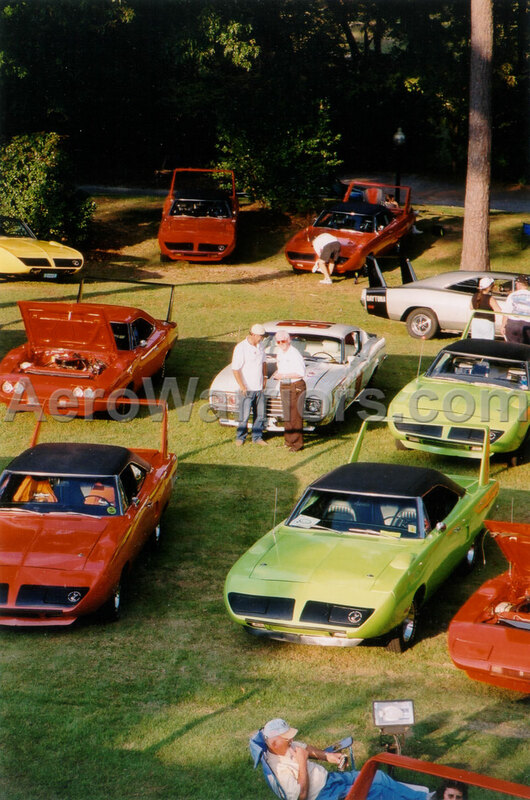 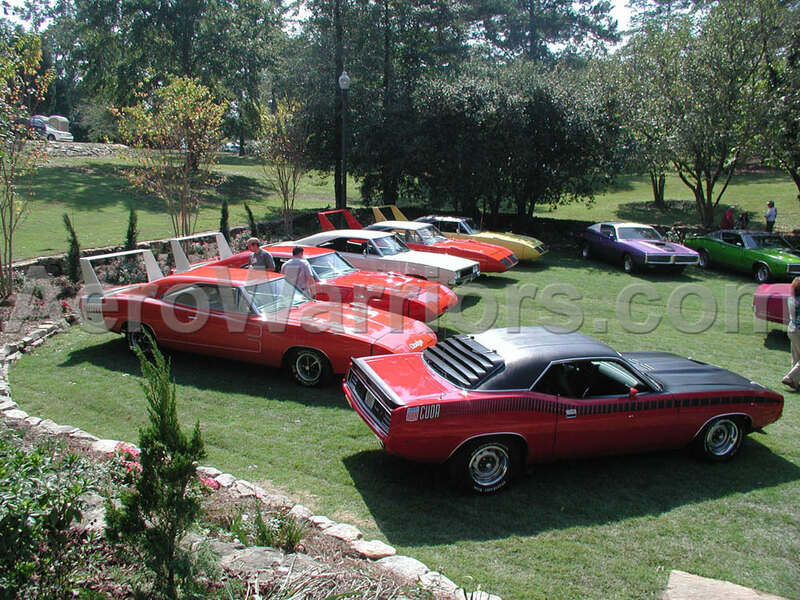 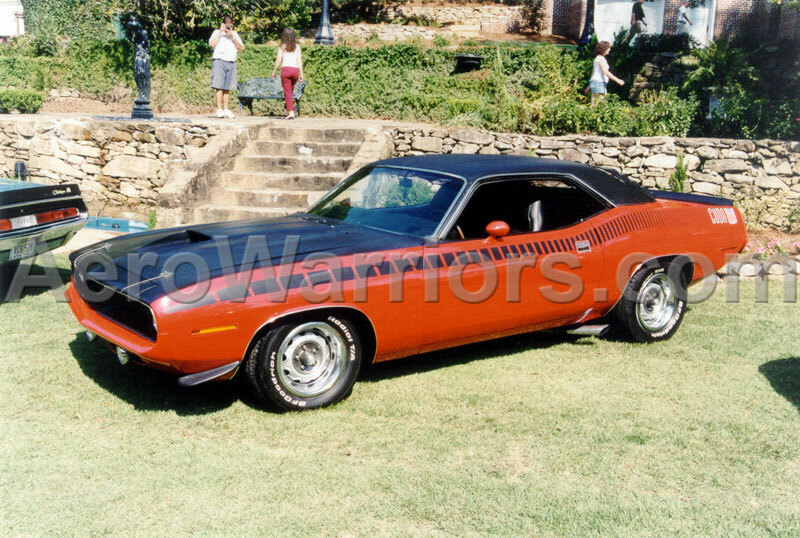 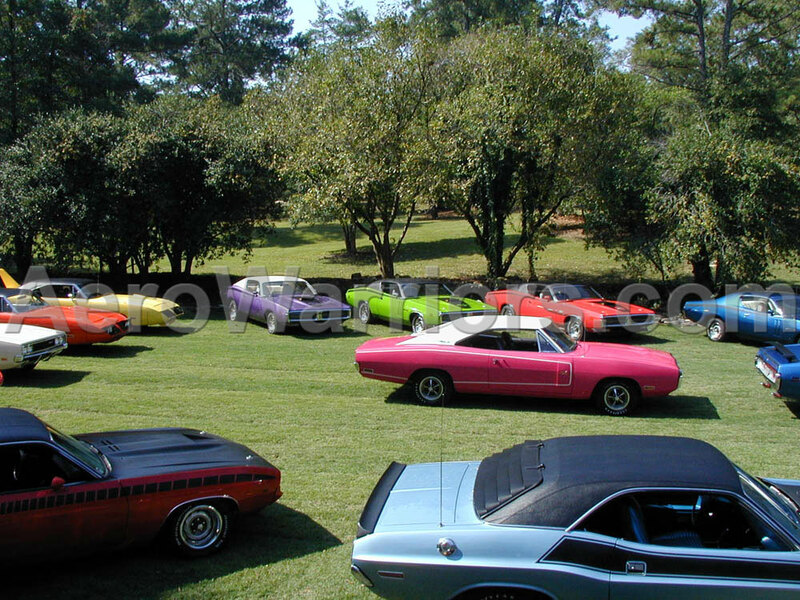 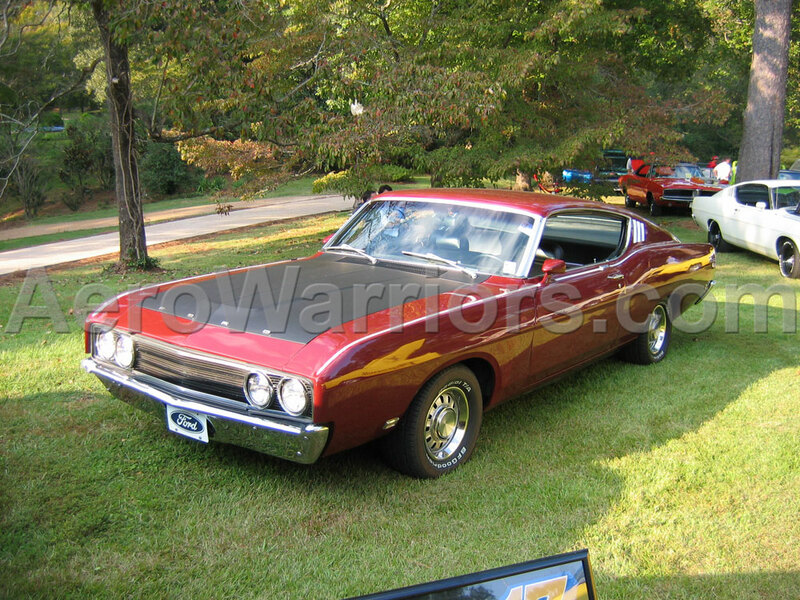 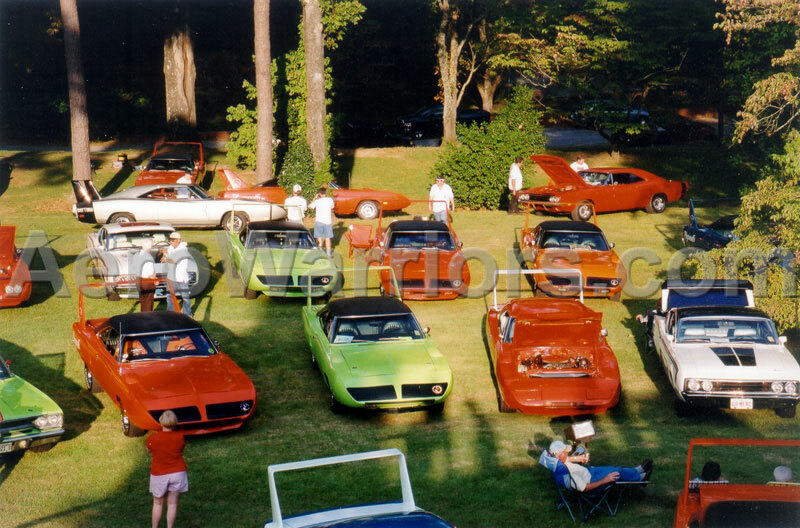 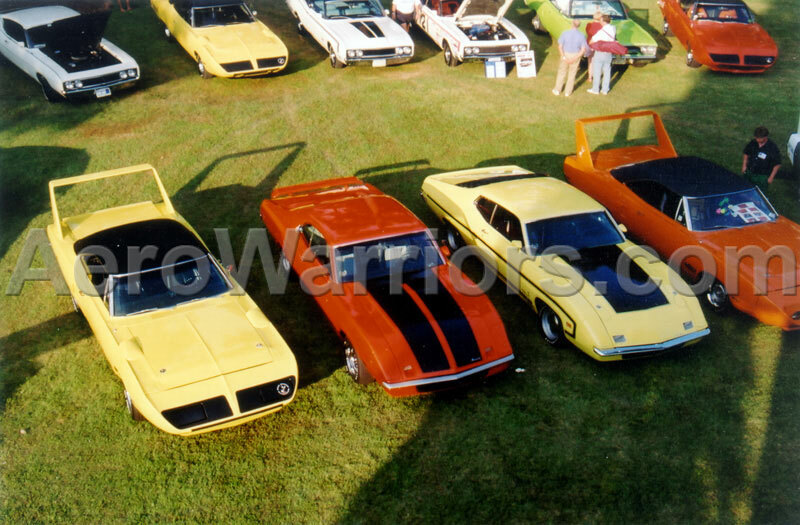 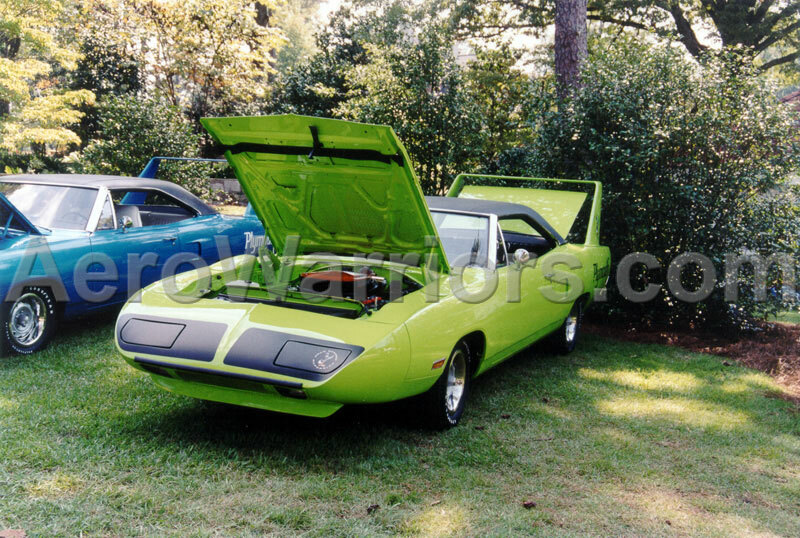 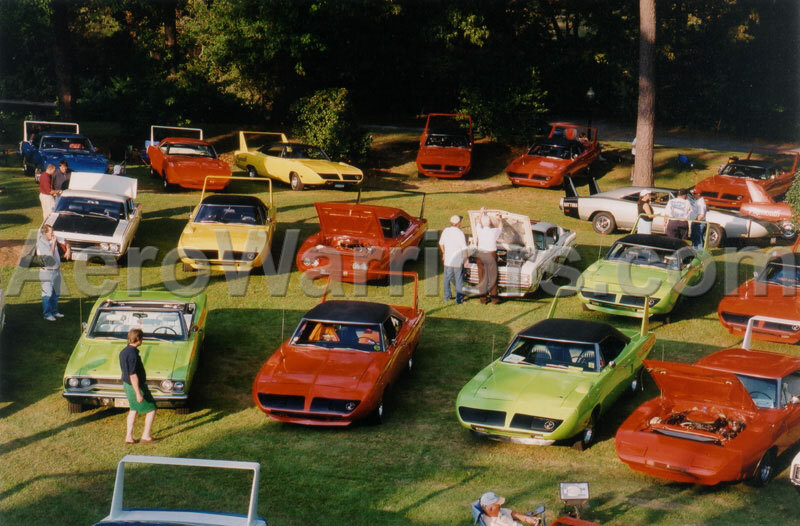 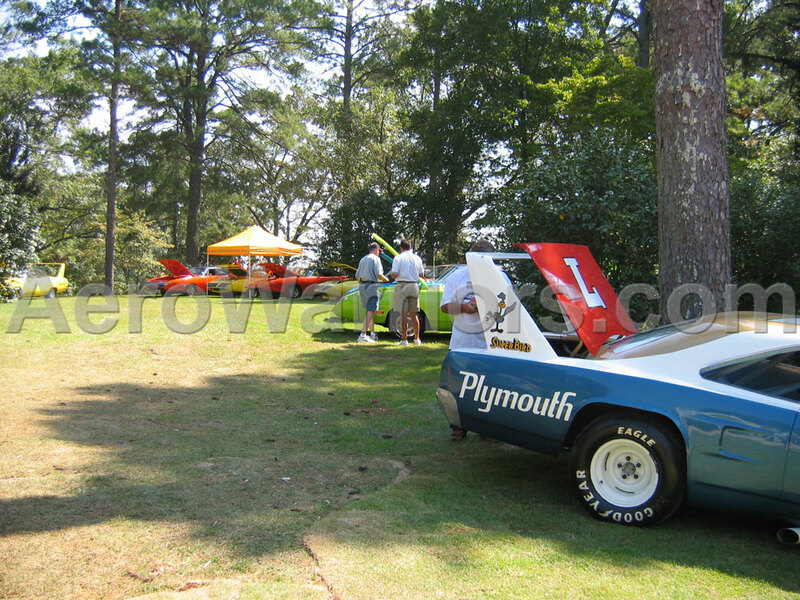 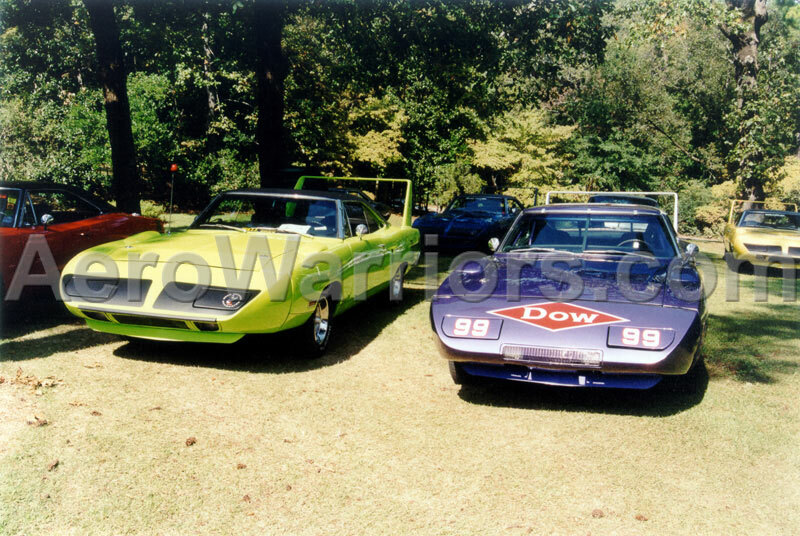 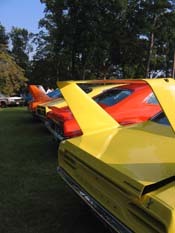 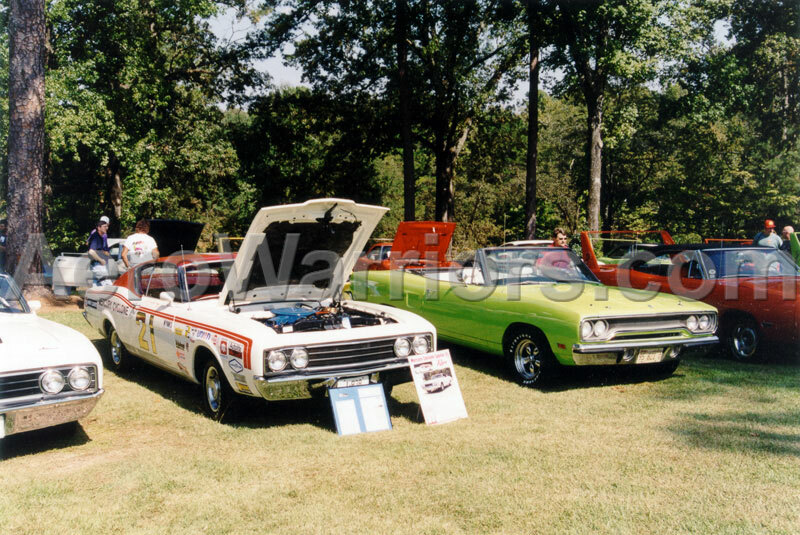 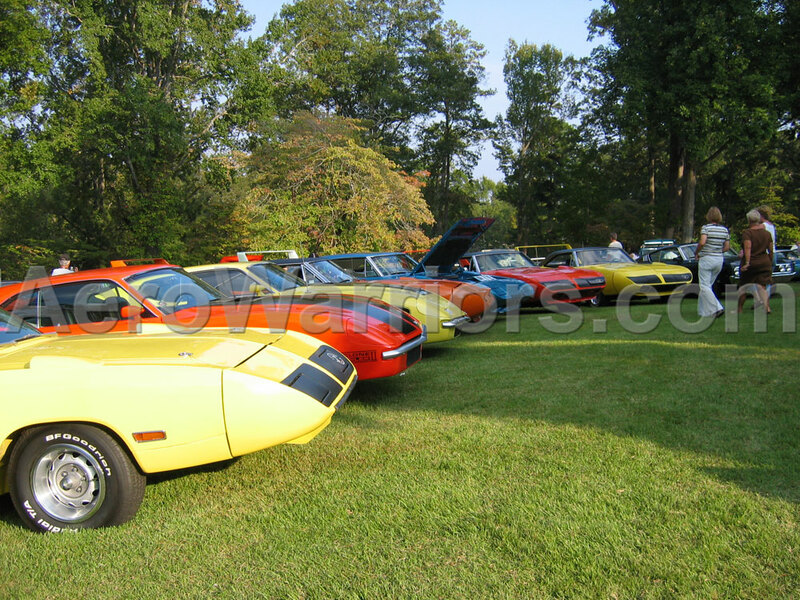 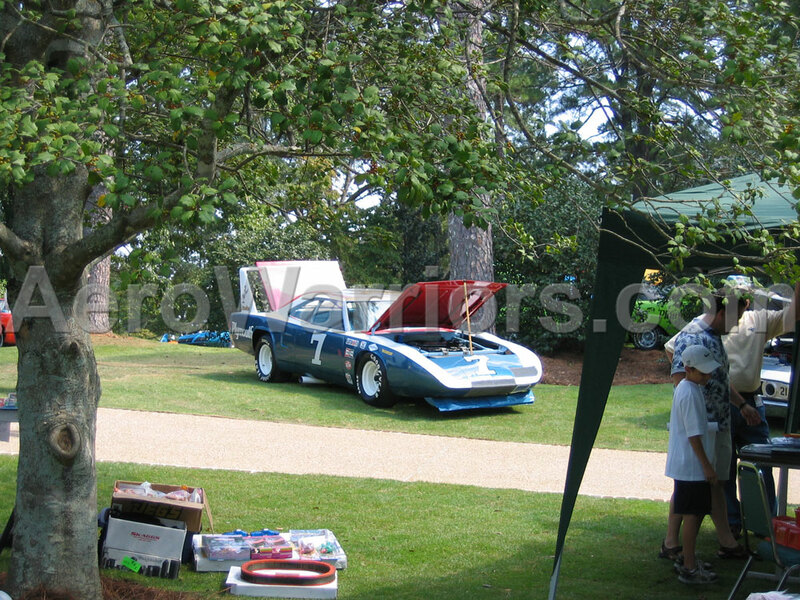 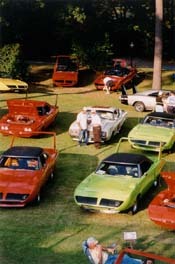 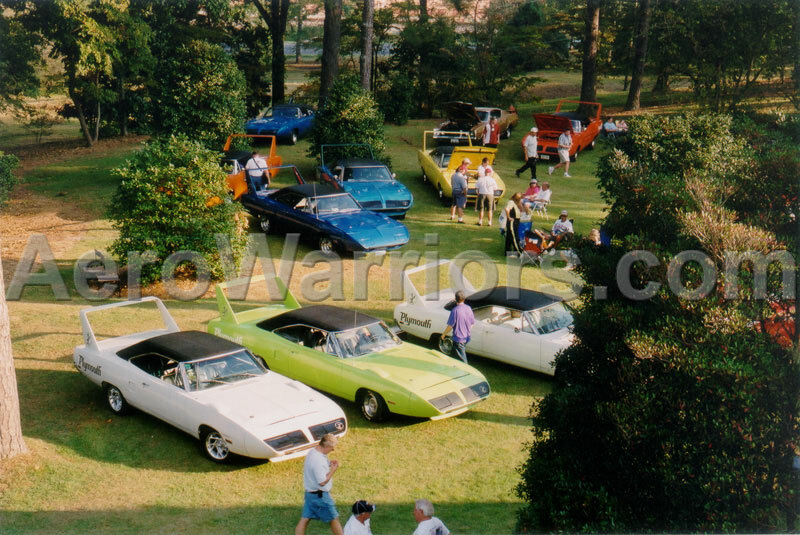 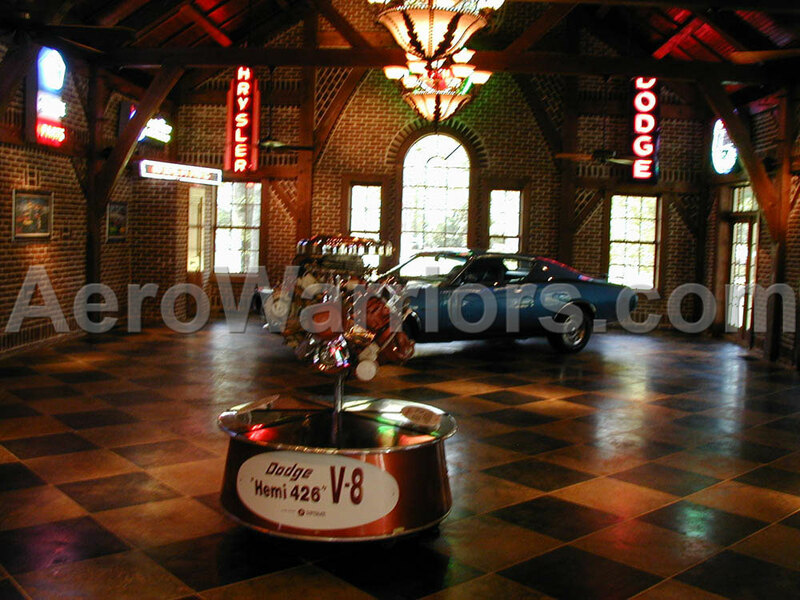 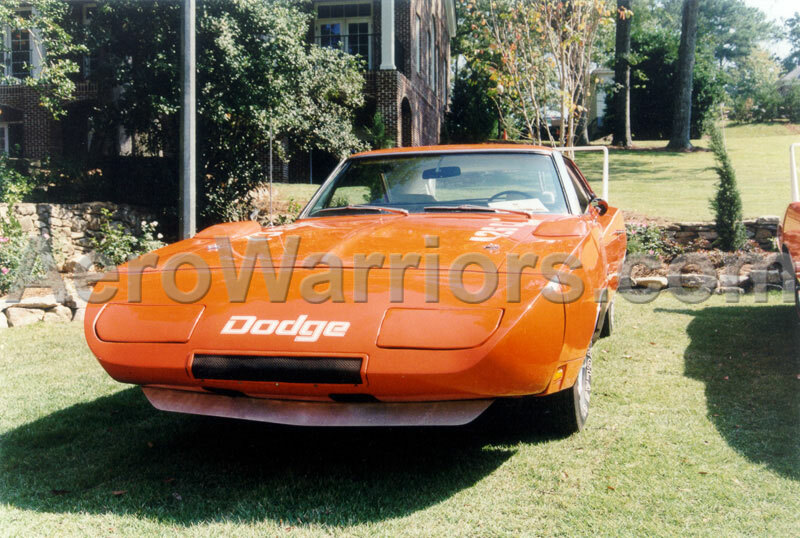 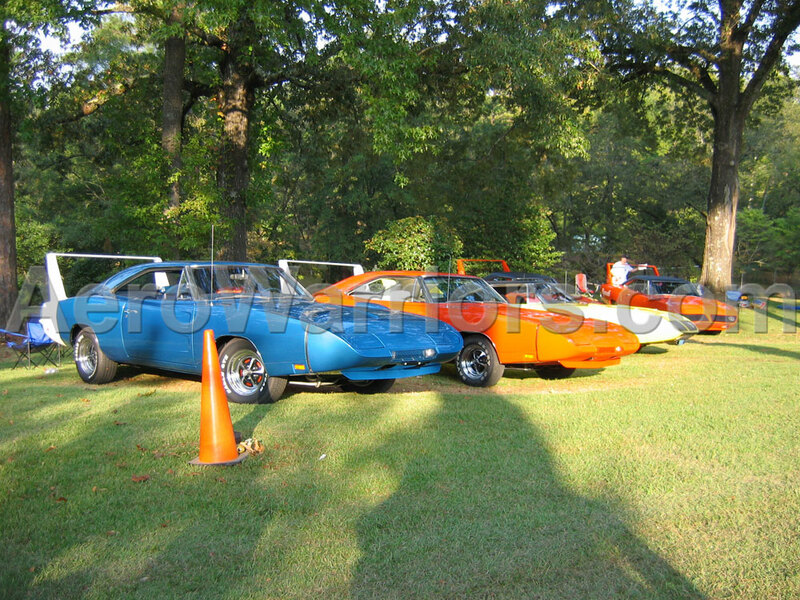 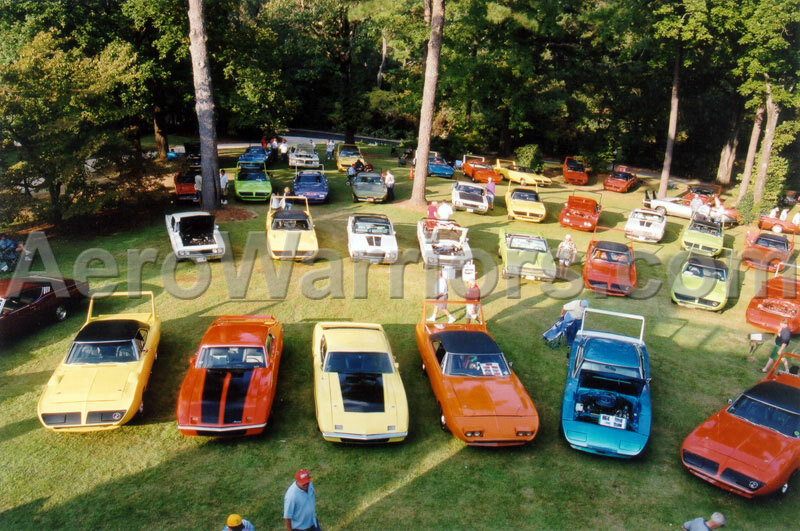 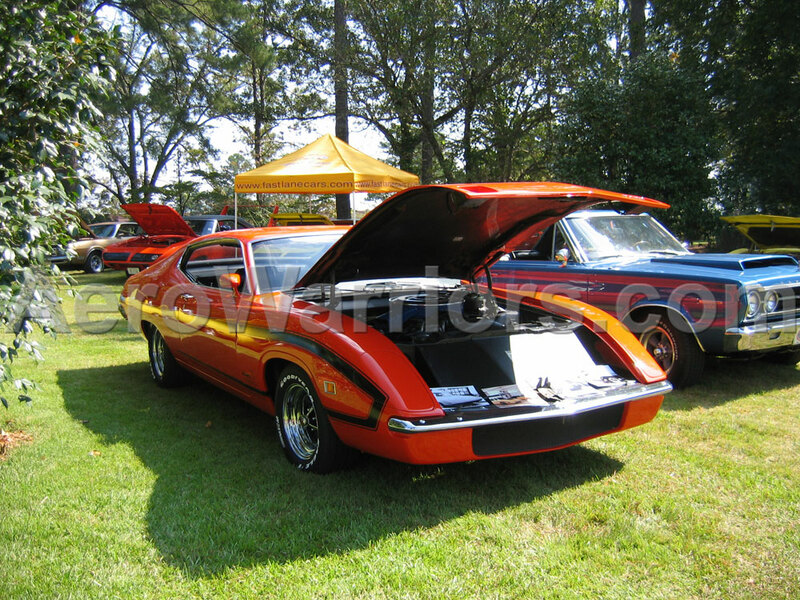 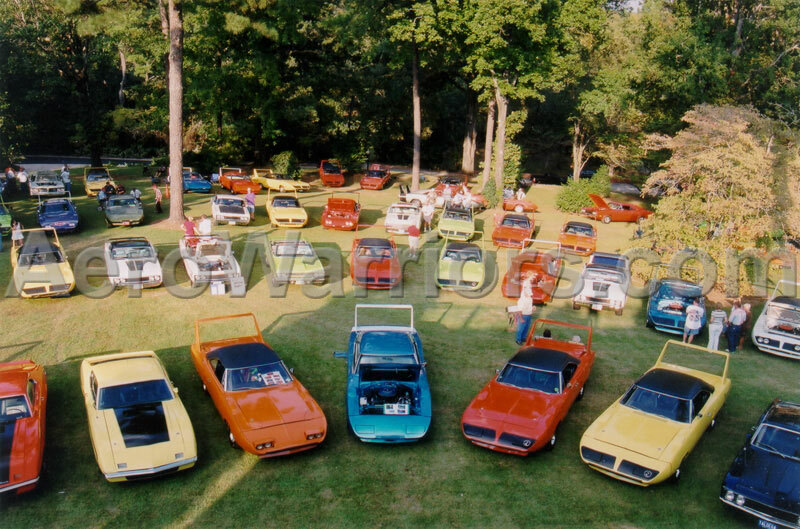 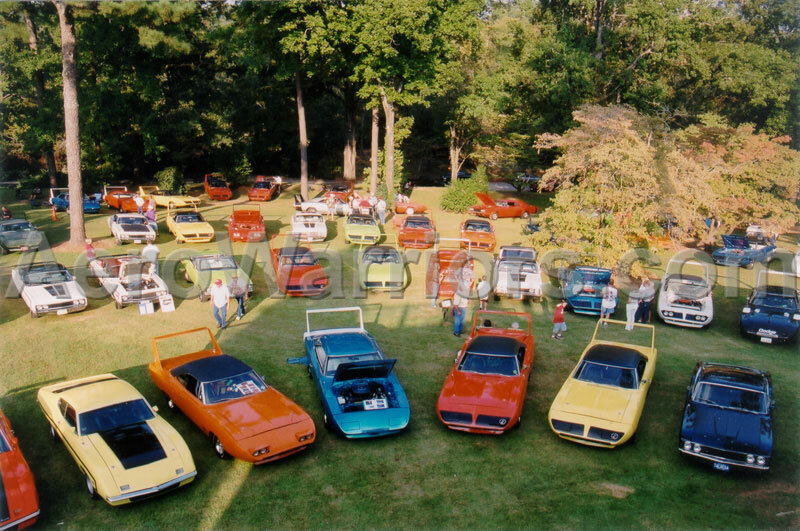 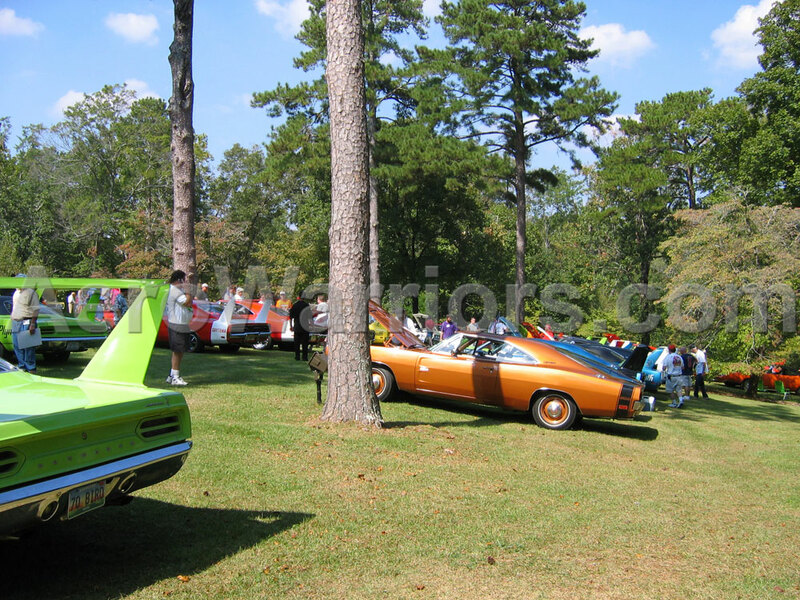 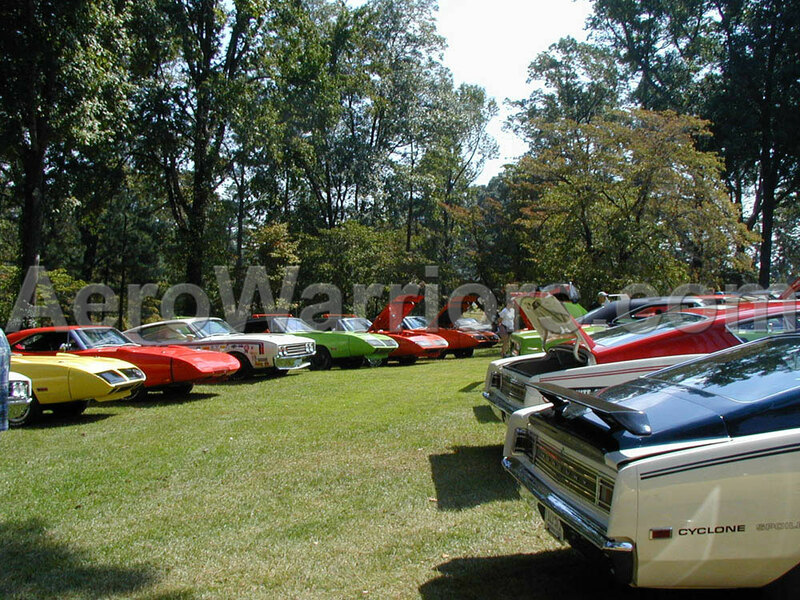 Aero car enthusiasts have gathered in Talladega, Alabama from time to time to celebrate the automotive legacy of the Aero Wars - the Dodge Charger 500 and Daytona, Plymouth SuperBird, Ford Torino Talladega and the Mercury Cyclone Spoiler II. 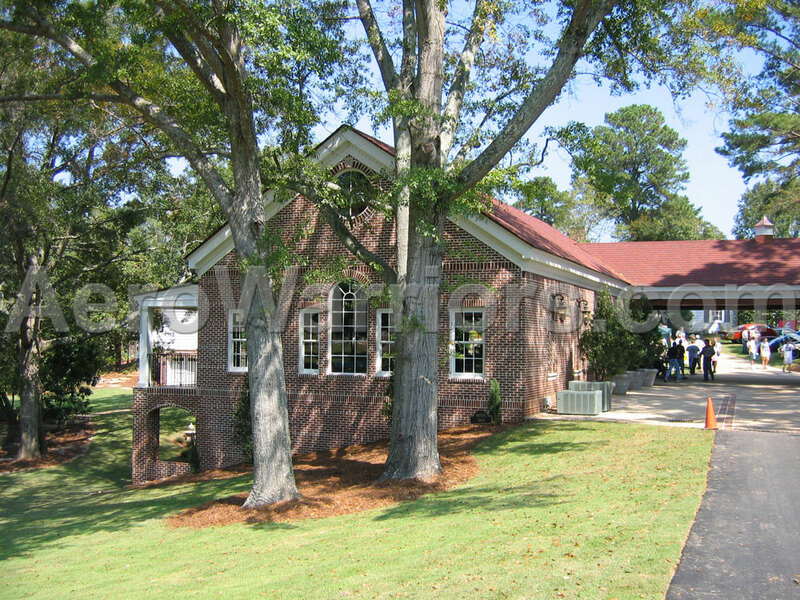 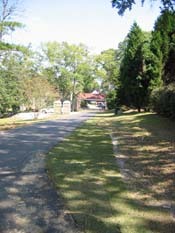 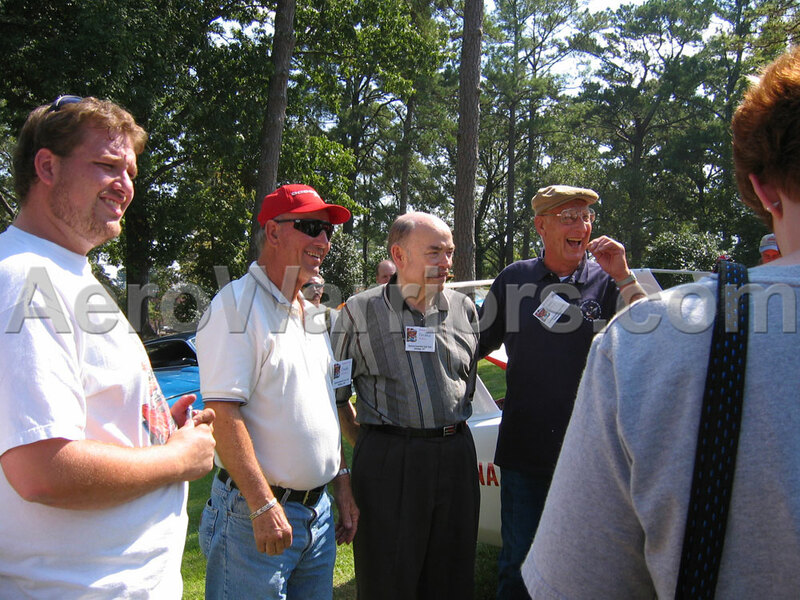 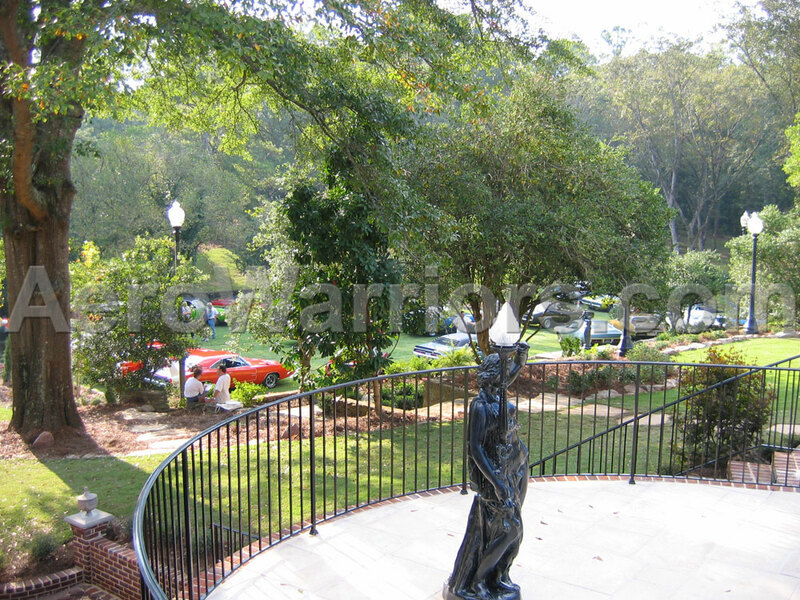 Reunions have been held in 1988, 1994, 1999, and 2004. 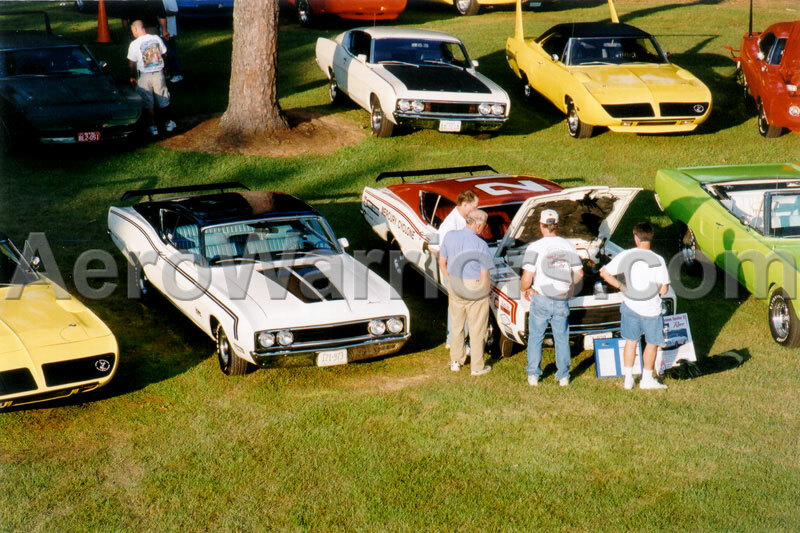 Photos from the 2004 meeting are showcased here. 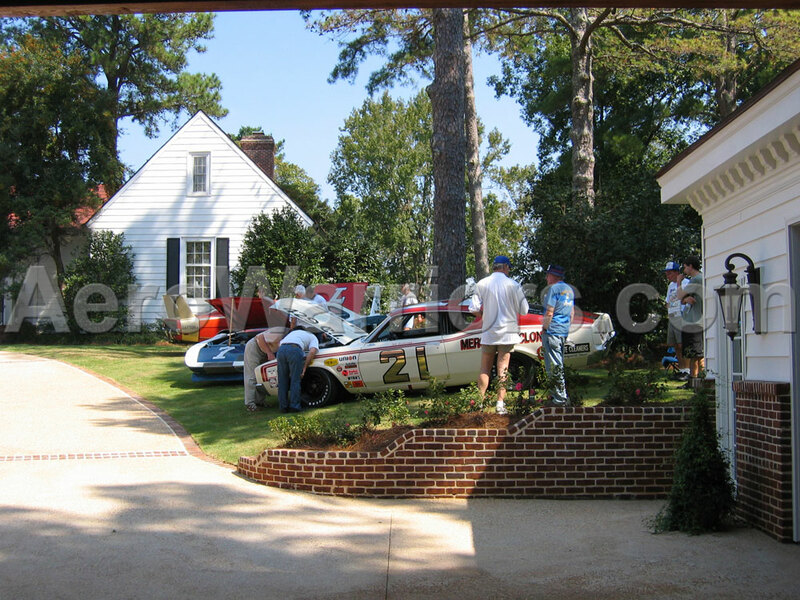 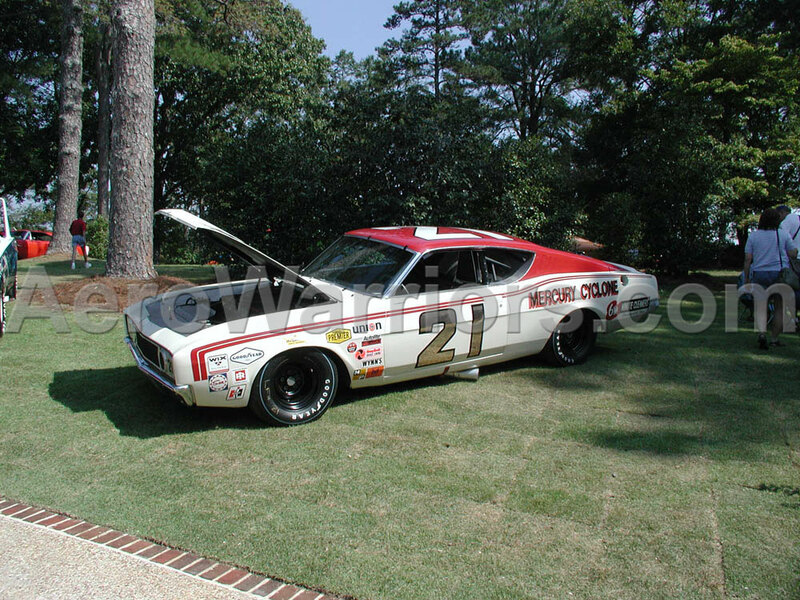 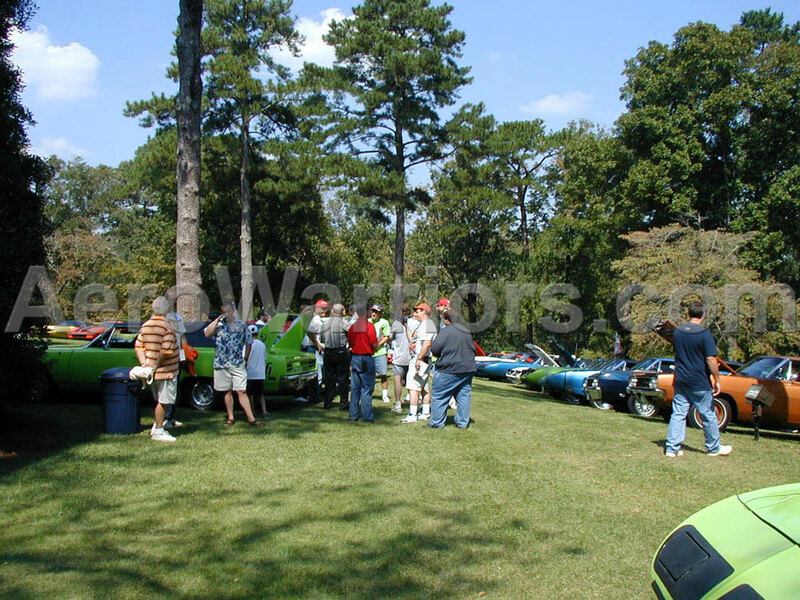 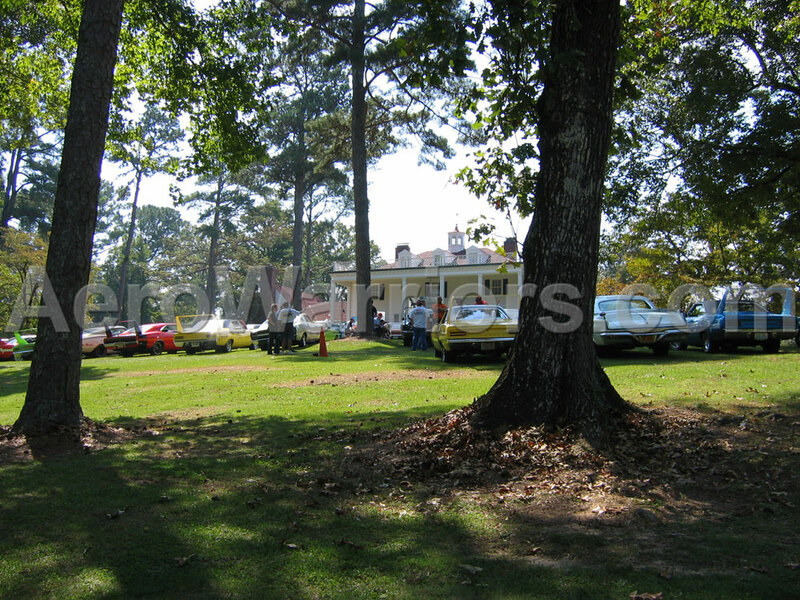 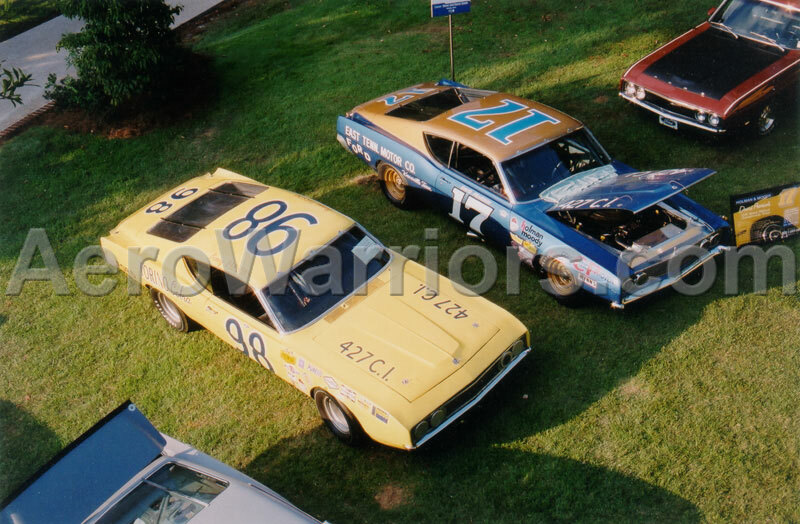 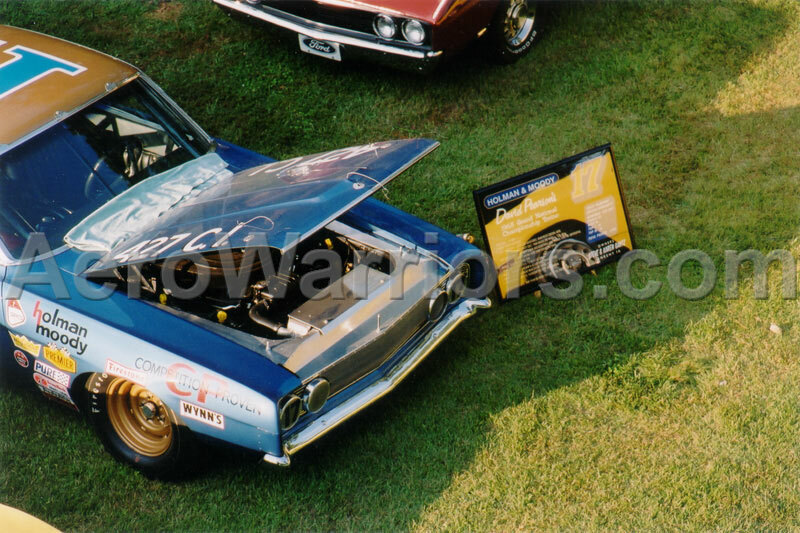 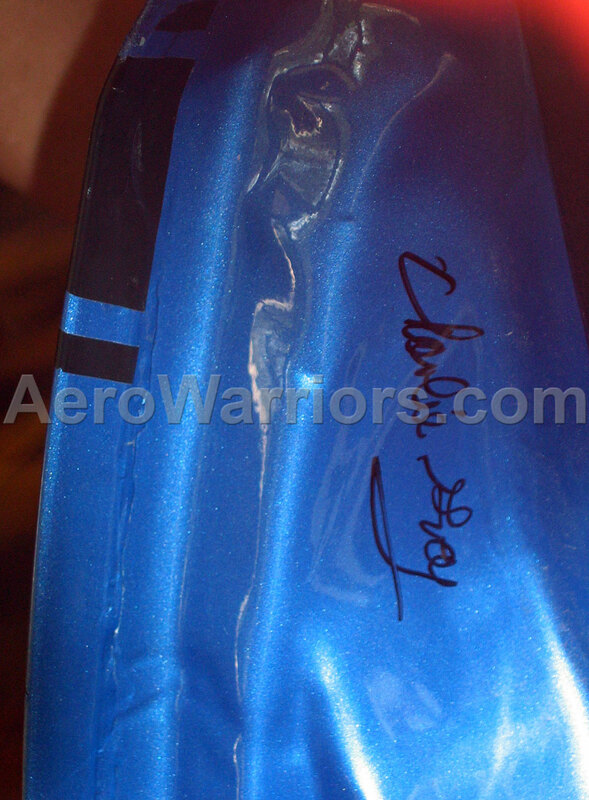 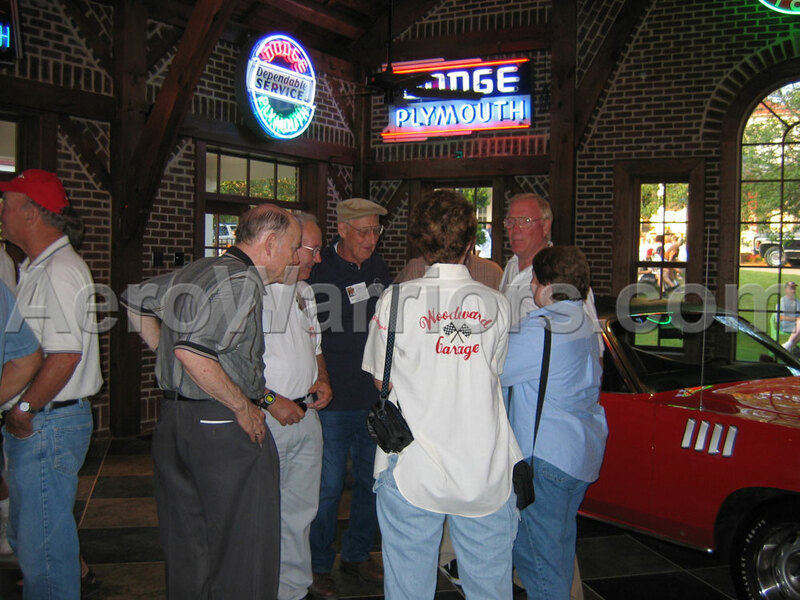 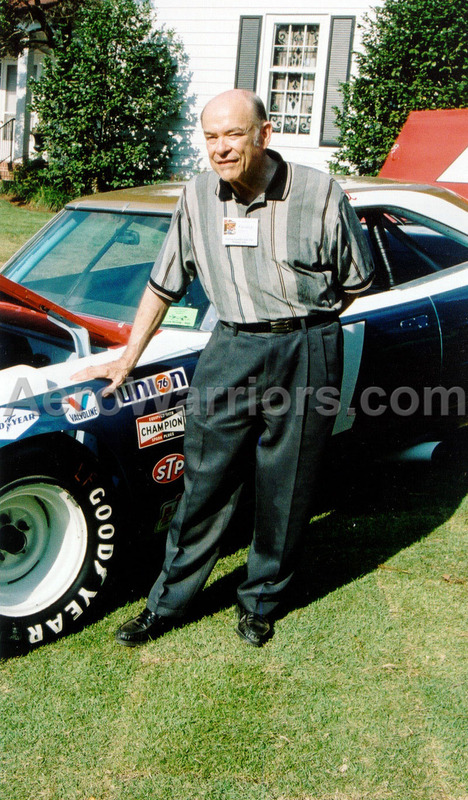 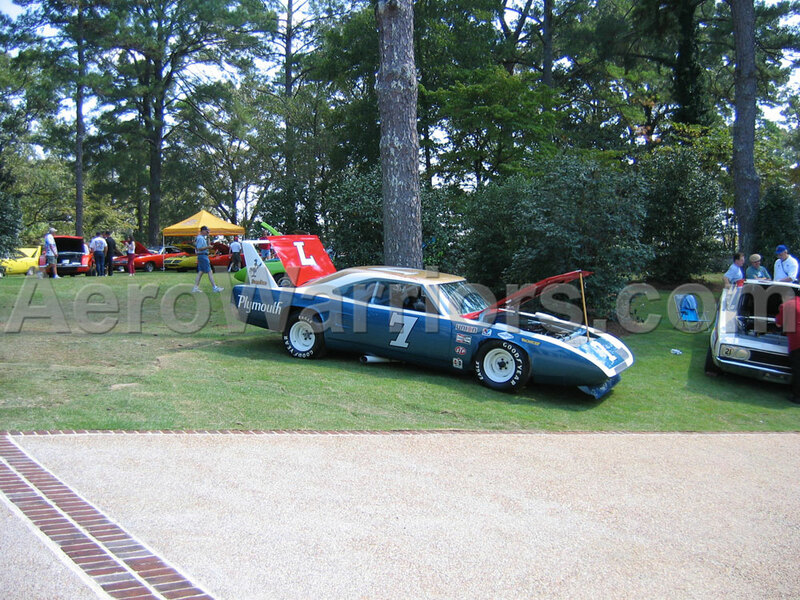 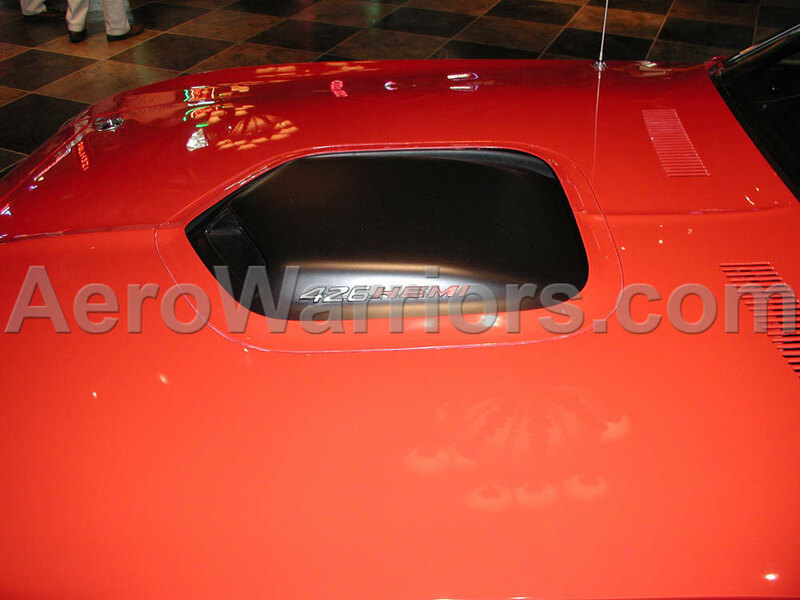 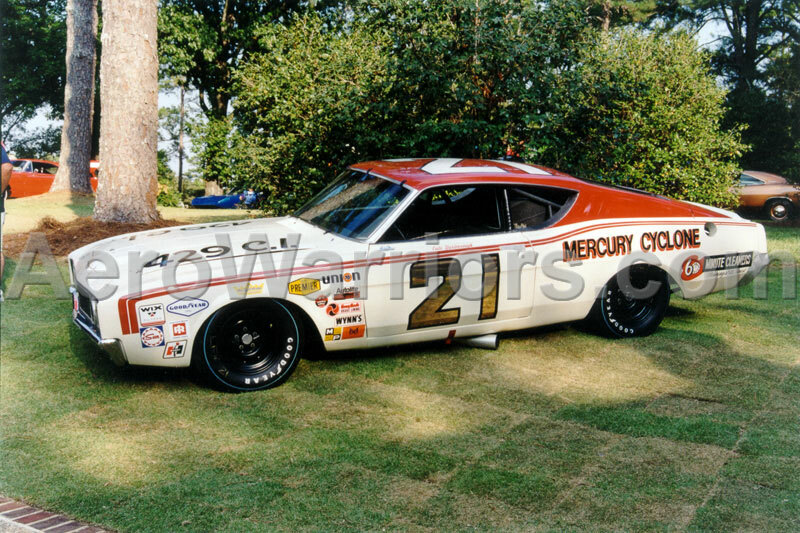 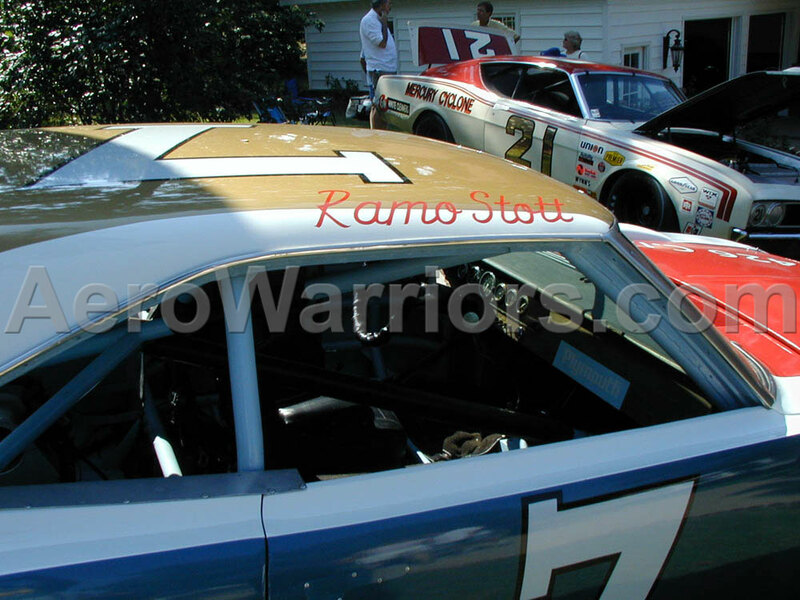 Other pic's of the 2004 event taken at Talladega Superspeedway and at The International Motorsports Hall of Fame are also available. 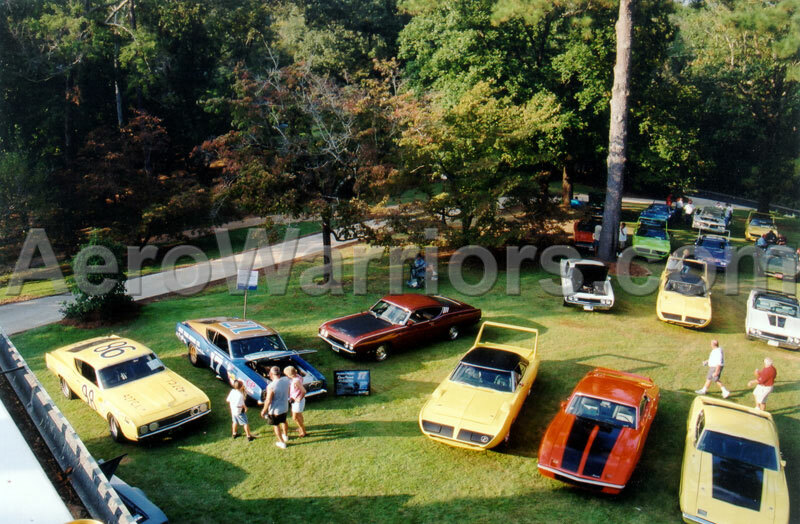 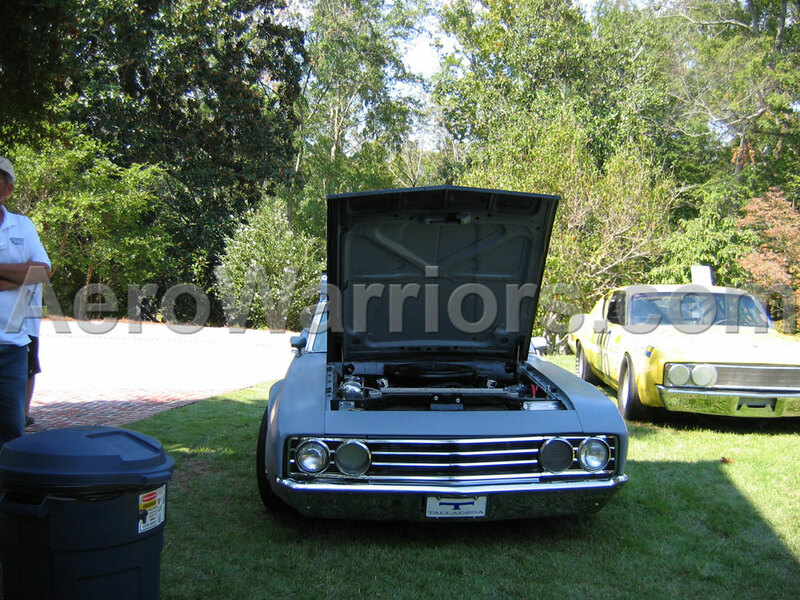 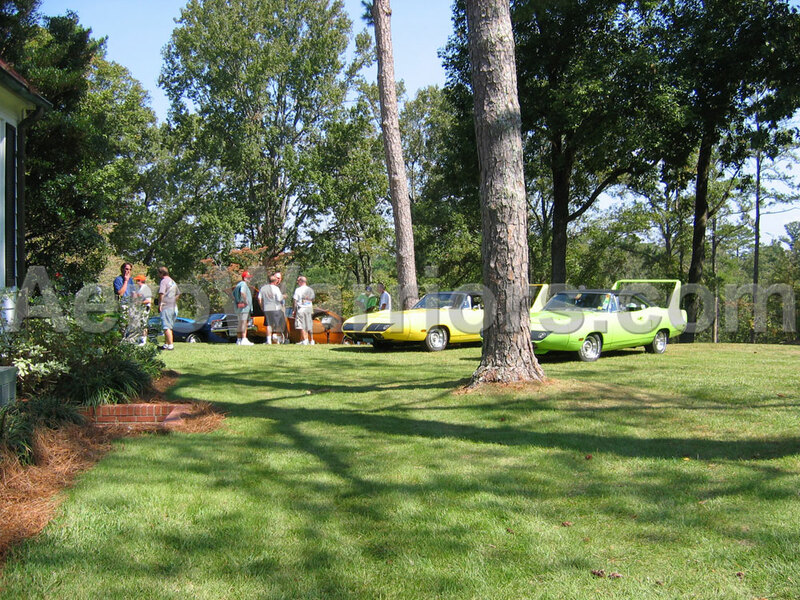 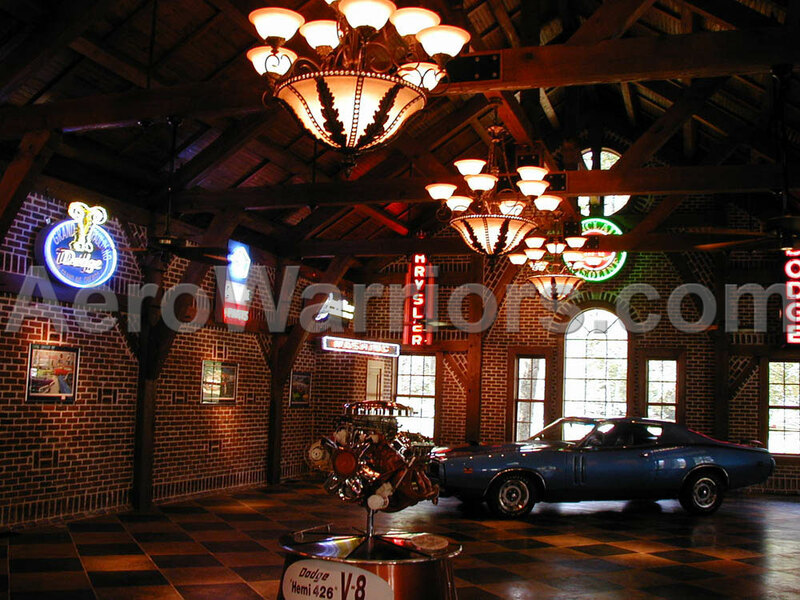 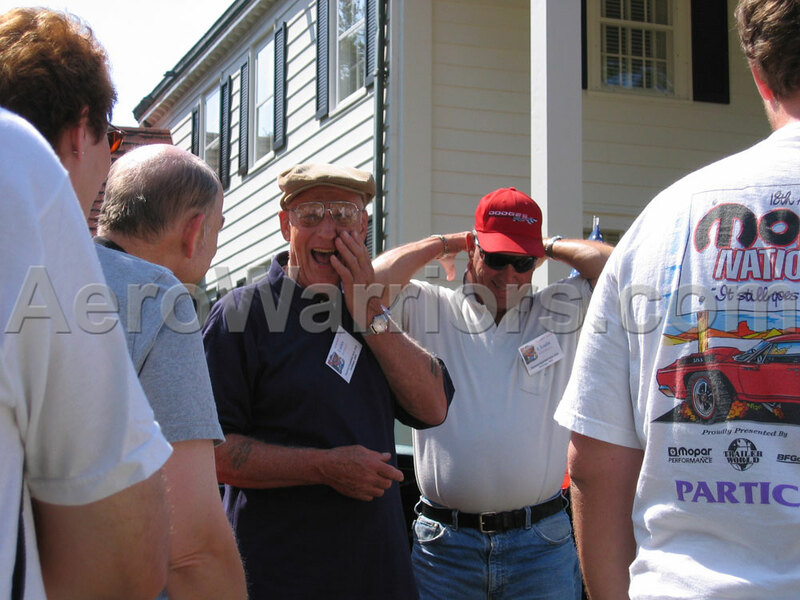 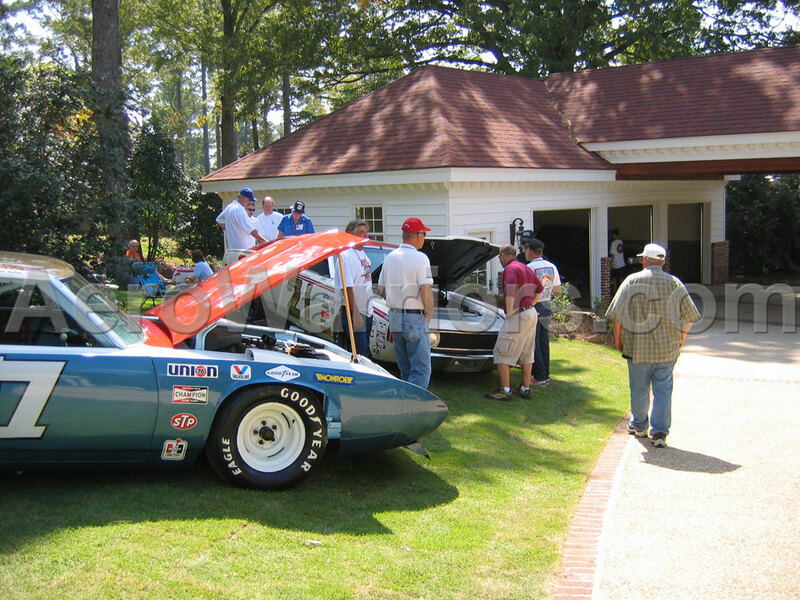 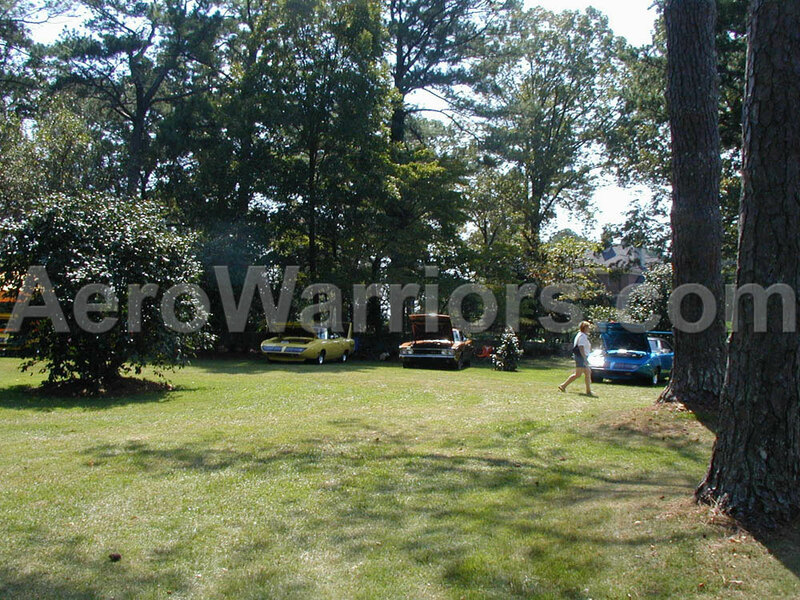 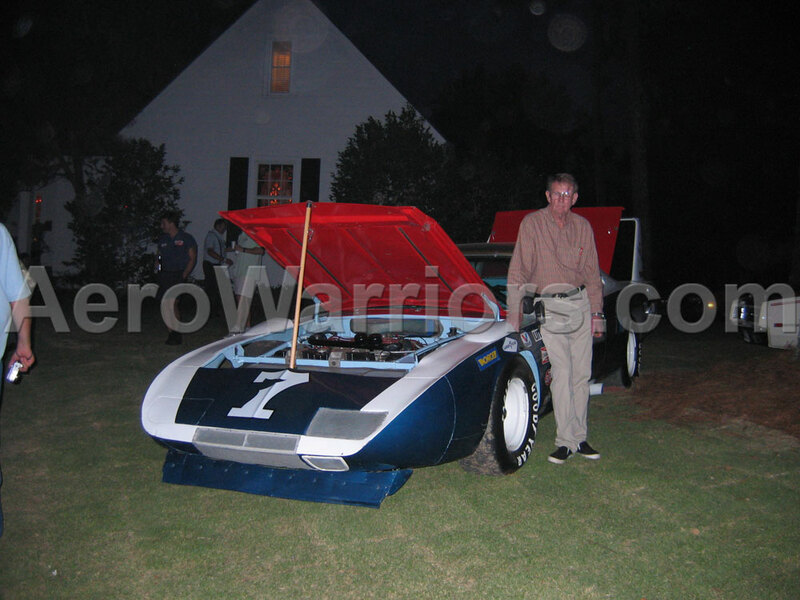 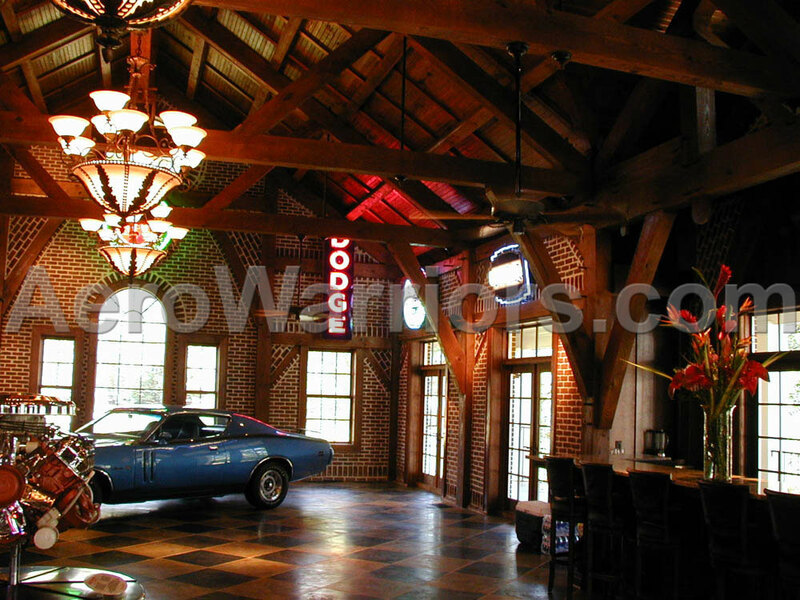 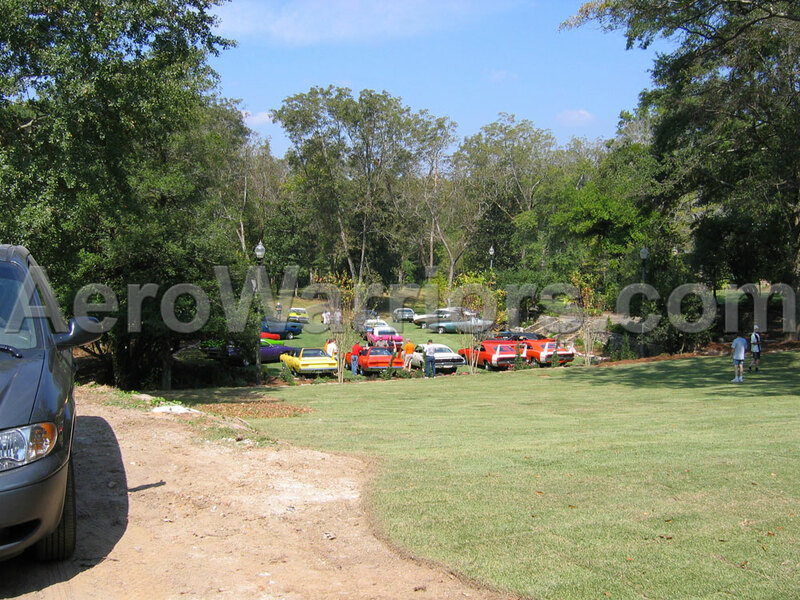 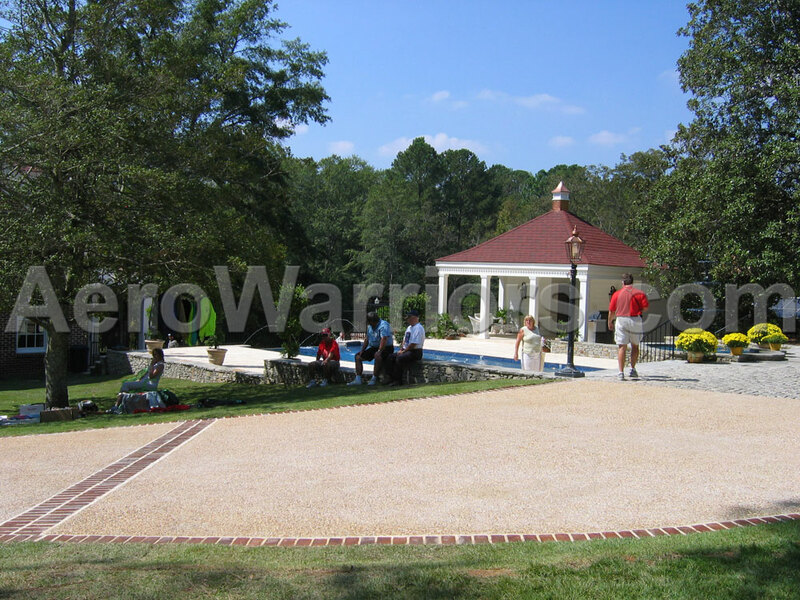 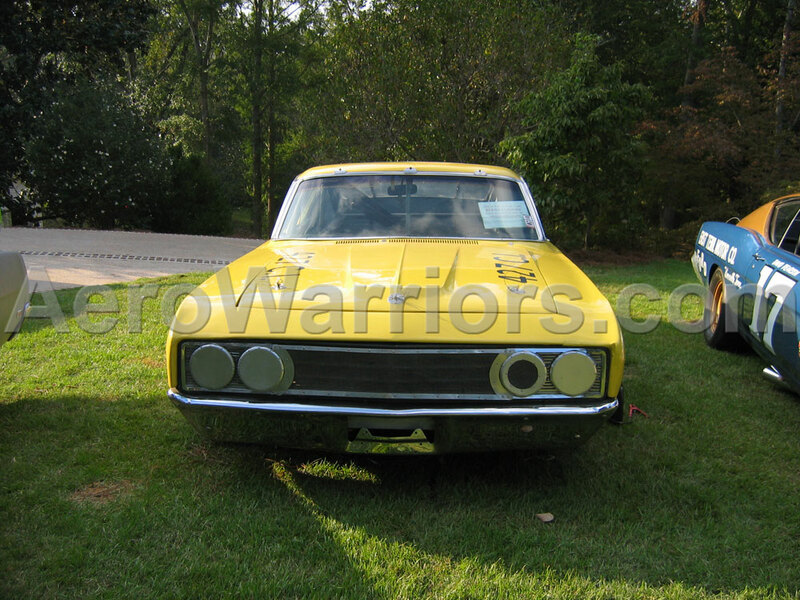 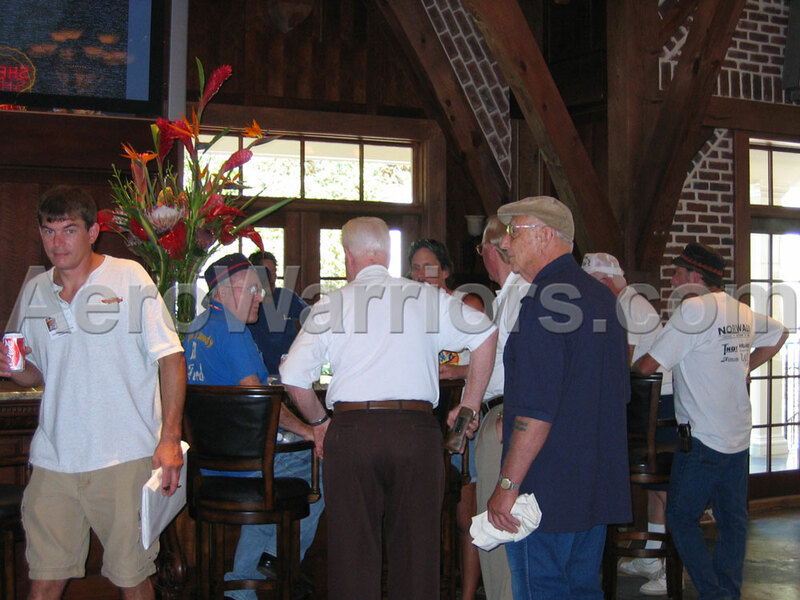 Aero Warrior Reunion attendees were hosted by meet organizer Tim Wellborn and his wife at their Alexander City, Alabama home. 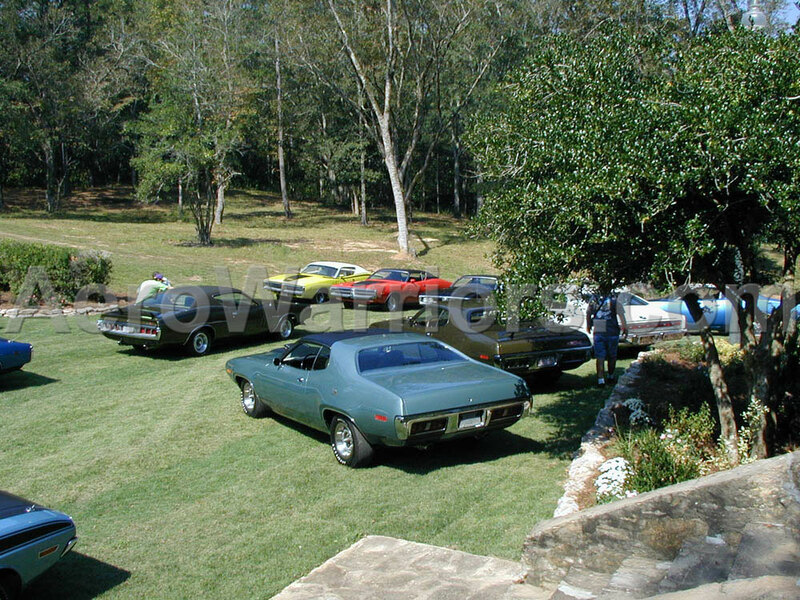 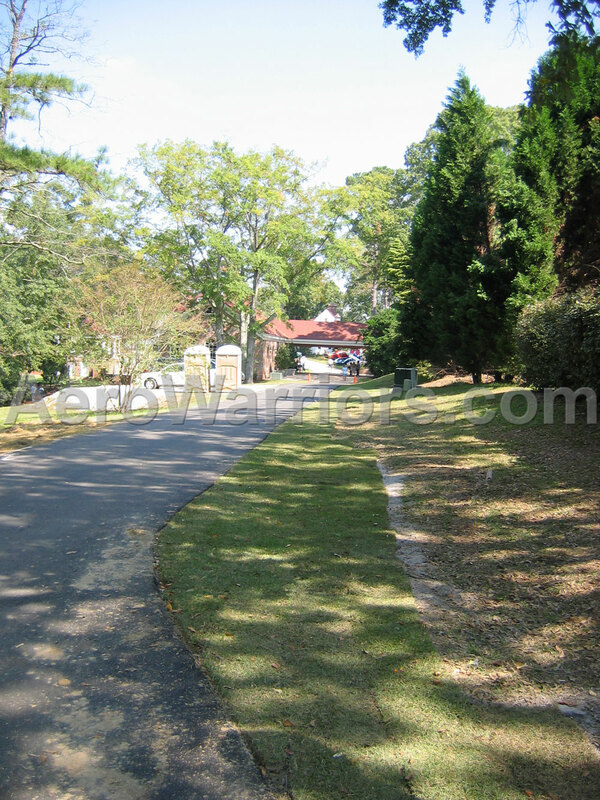 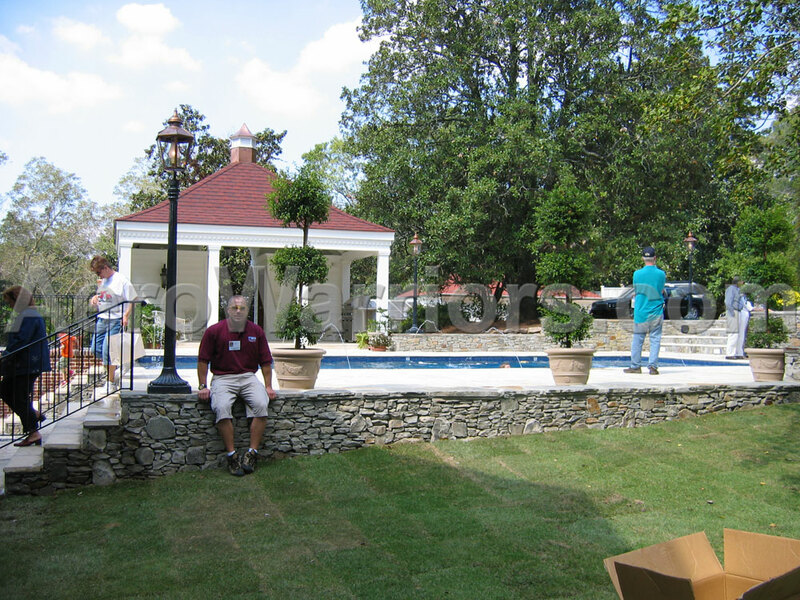 The grounds were immacualte, as were the swimming pool with waterfall and the several garages (one of which was equipped with wet bar, air conditioning and big screen TV!). 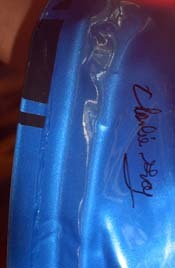 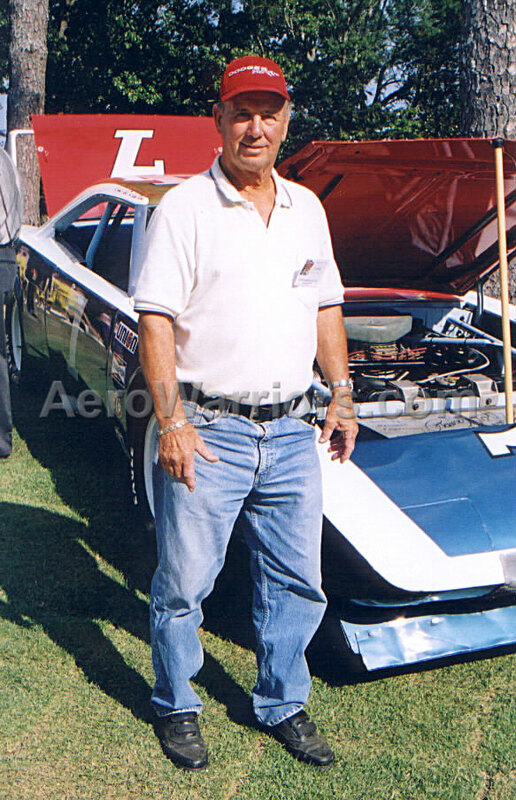 Chrysler engineer George Wallace with the #7 Ramo Stott SuperBird. 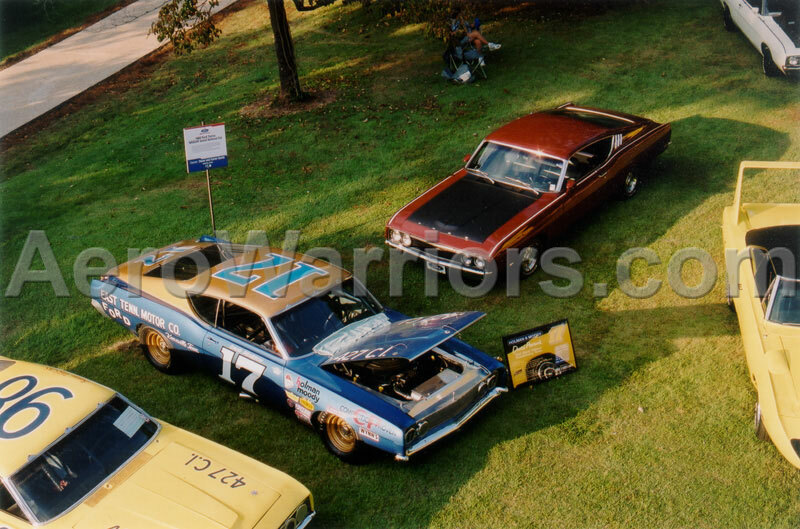 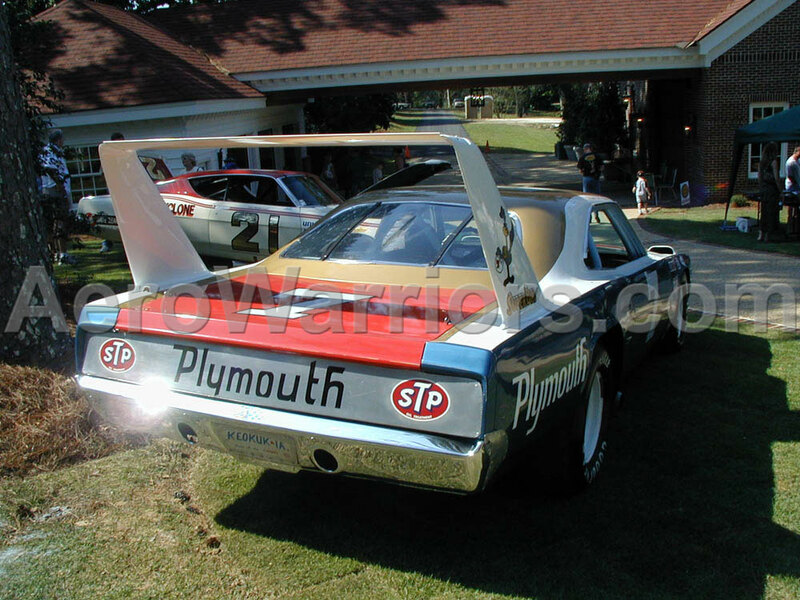 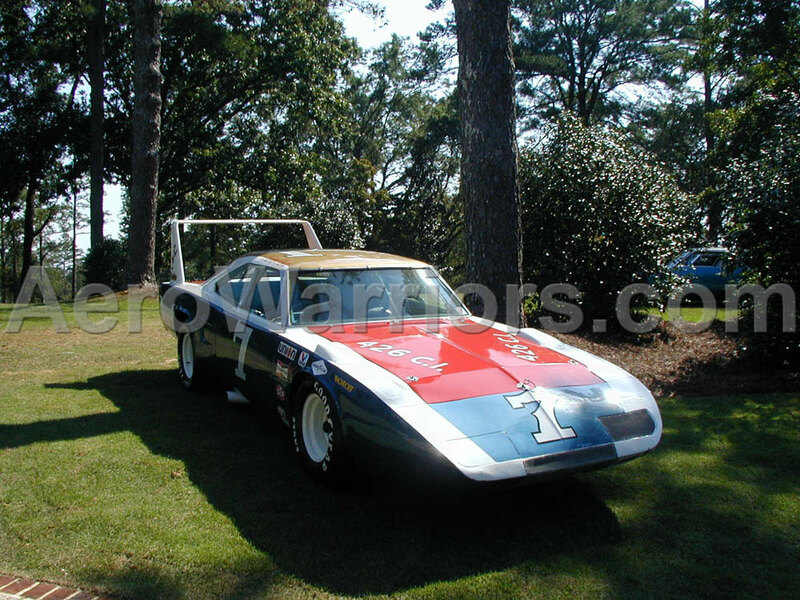 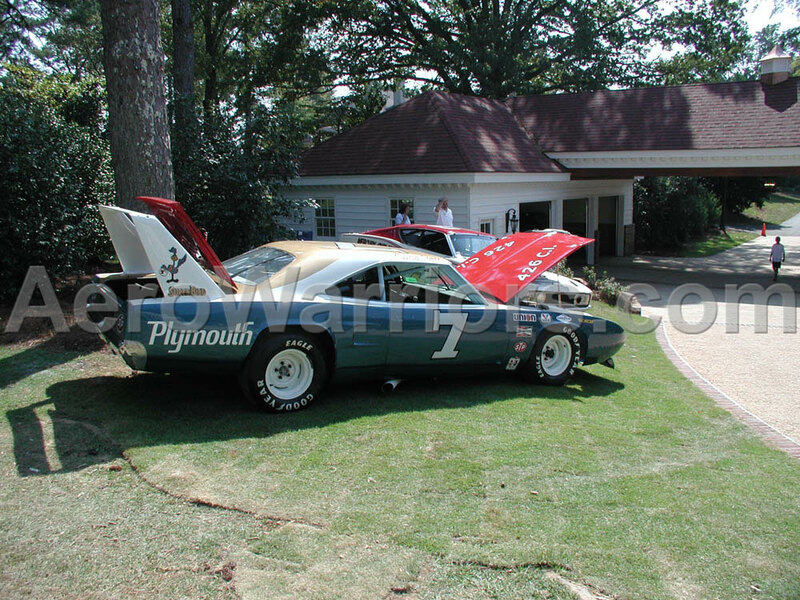 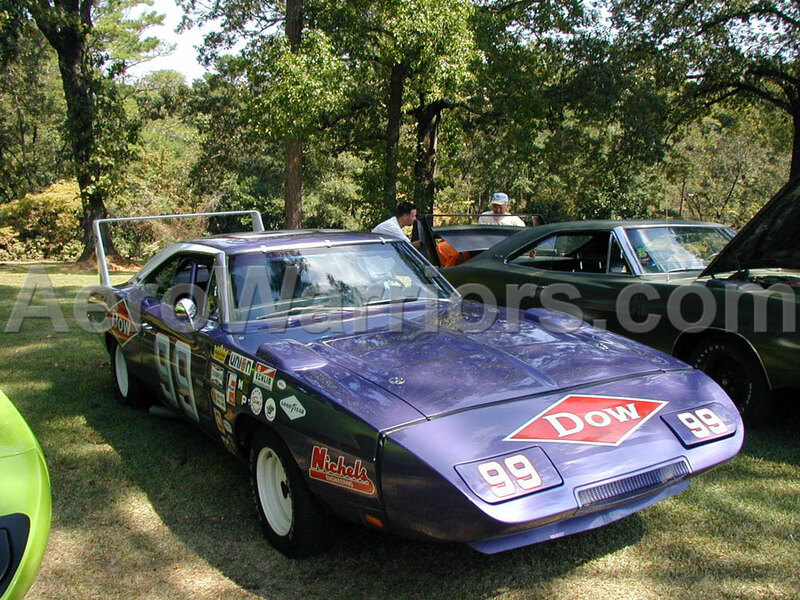 Dodge Charger Daytona driver Charlie Glotzbach with the #7 Ramo Stott SuperBird. 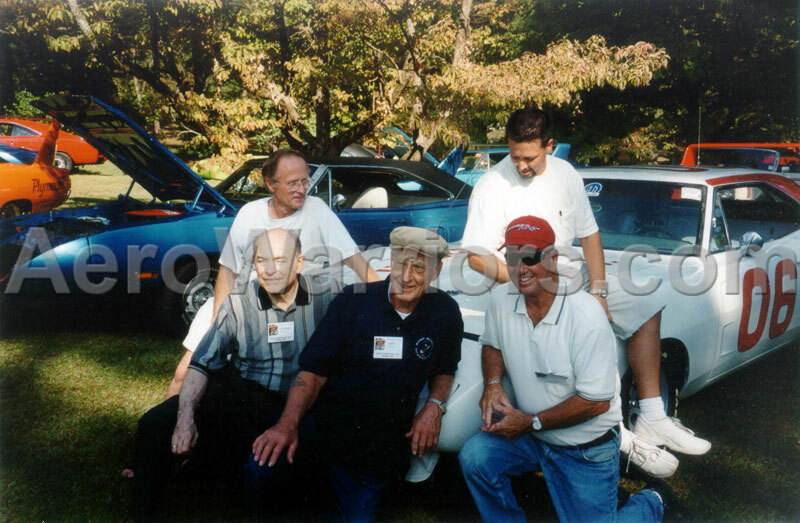 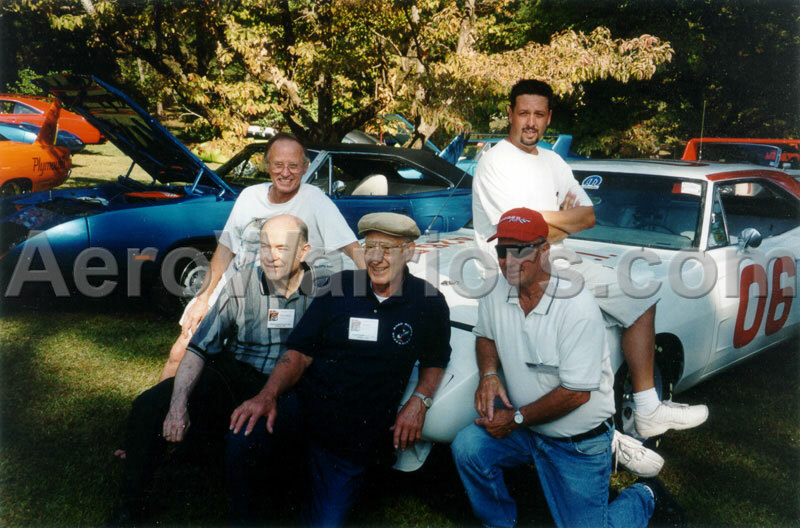 Three simialar shots of Joe Machado and son Sean (top row) with Chrysler engineer George Wallace, Chrysler racing boss Larry Rathgeb and Chargin' Charlie Glotzbach. 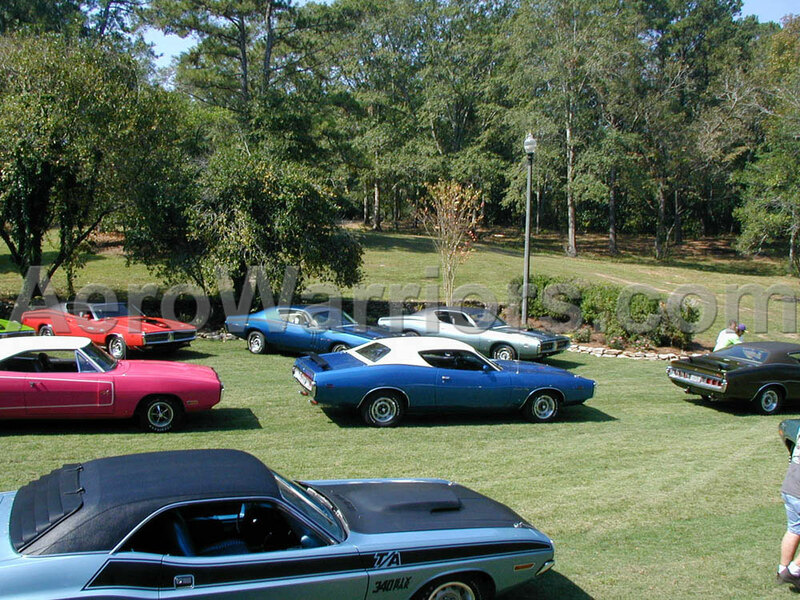 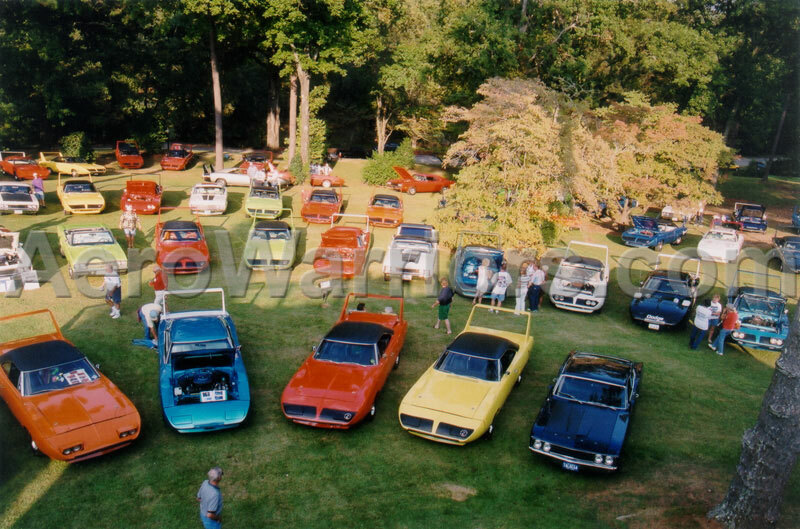 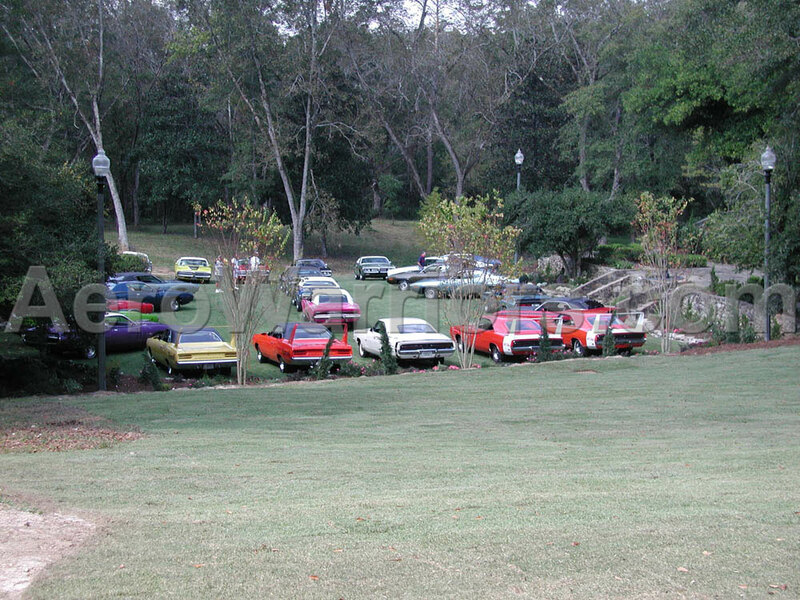 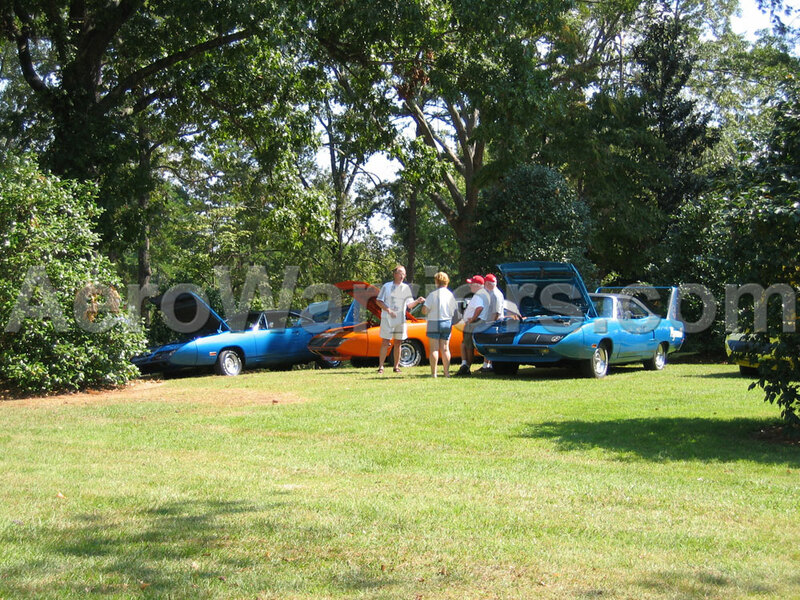 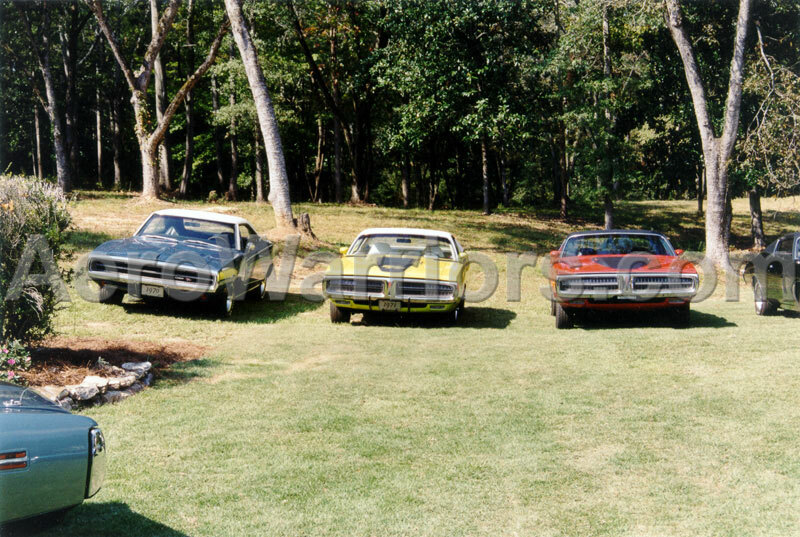 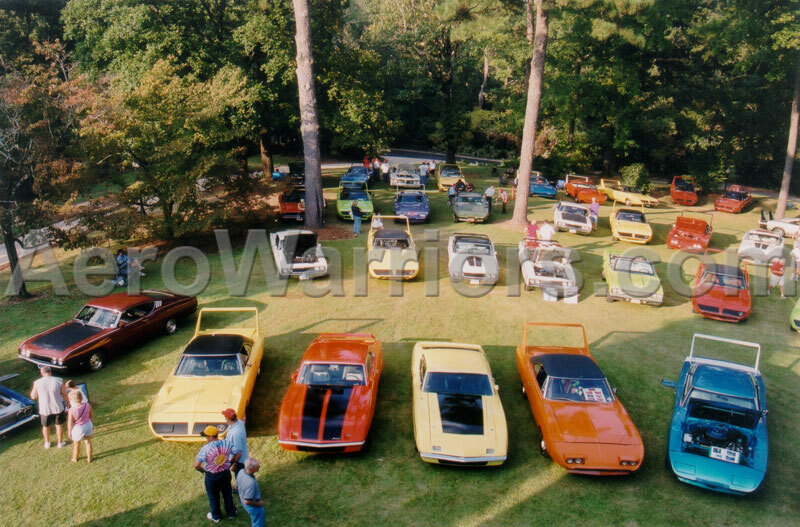 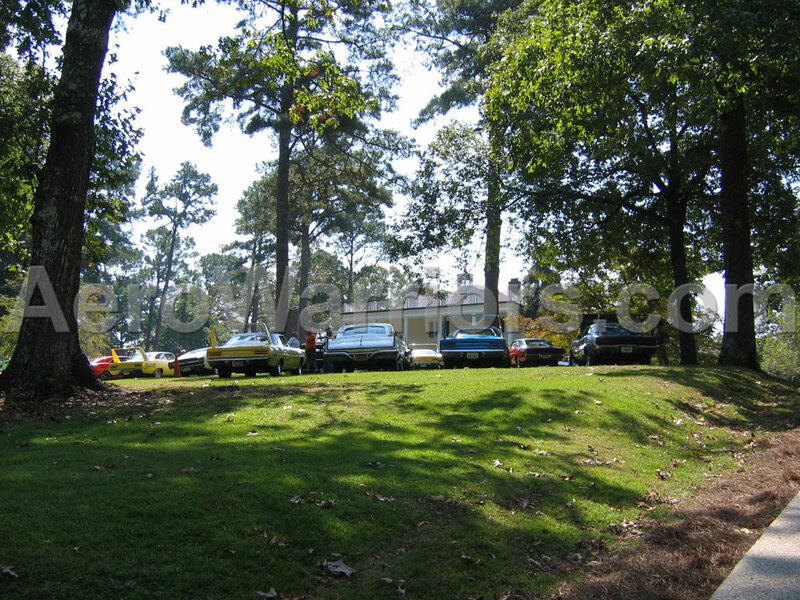 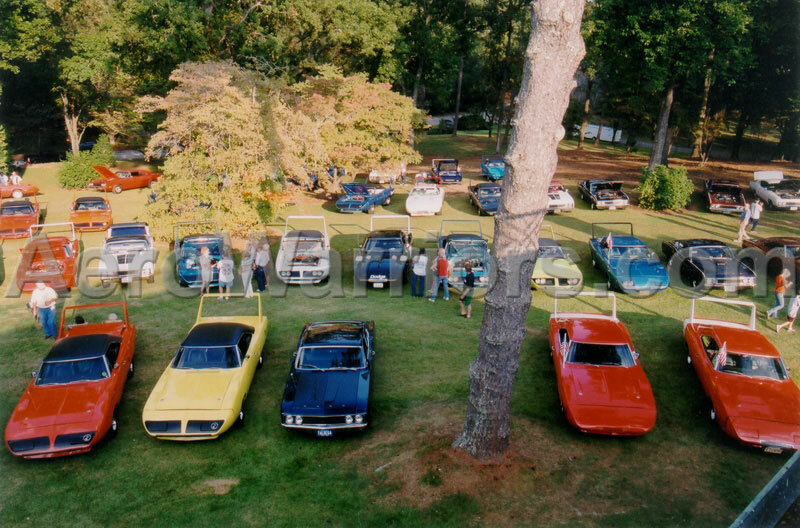 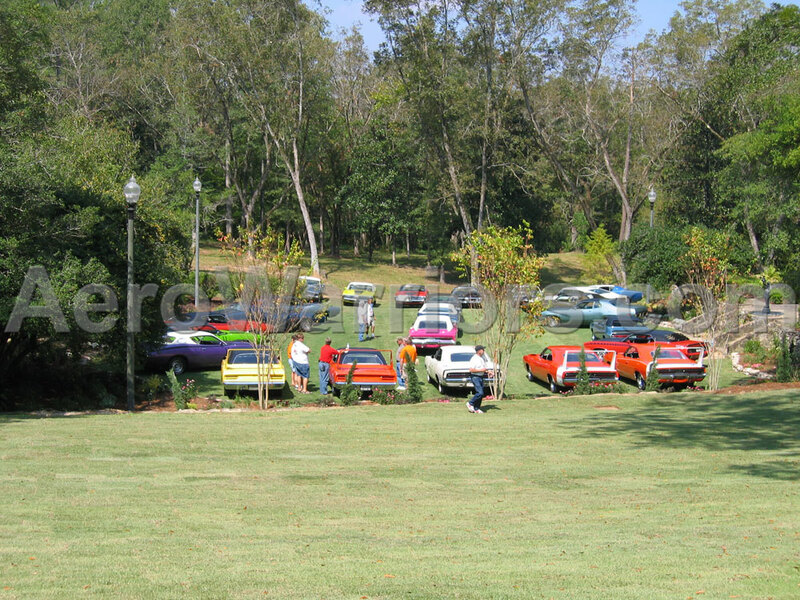 A small portion of Tim Wellborn's car collection. 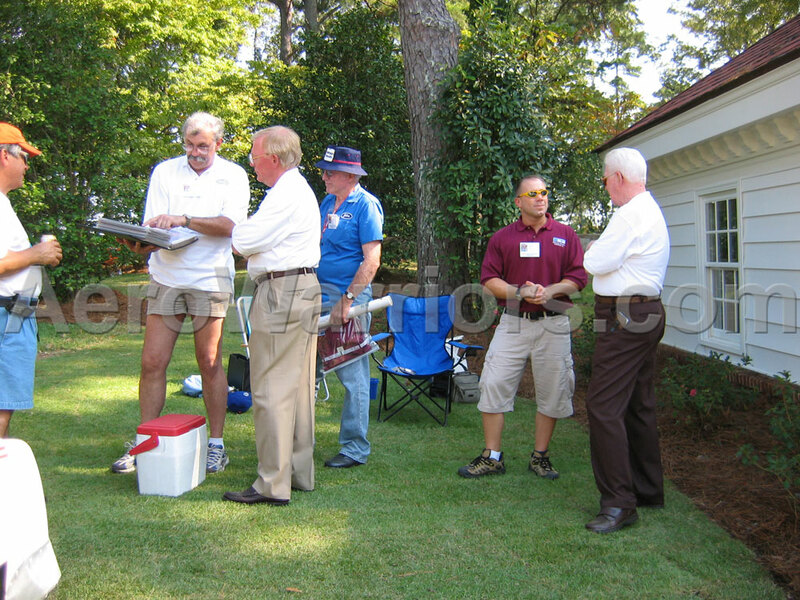 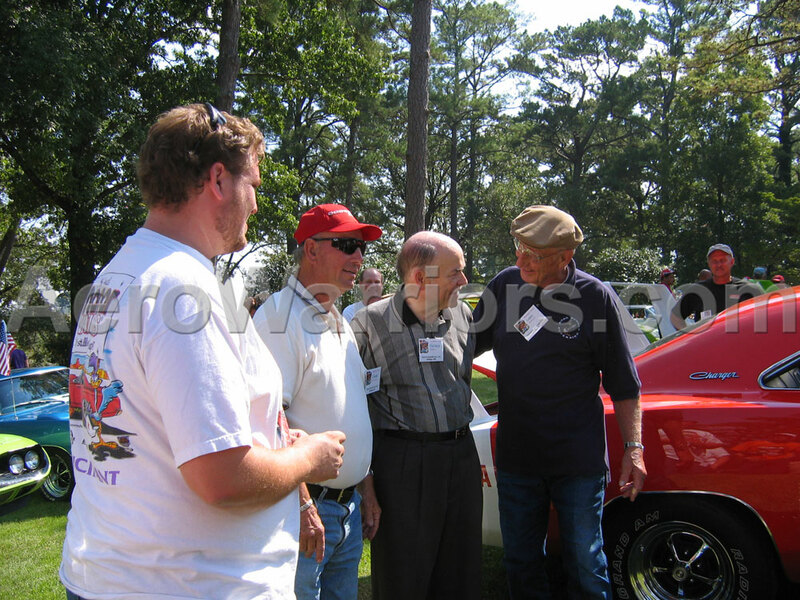 Dr. John Craft (blue baseball cap) discusses some Ford information he's collected. 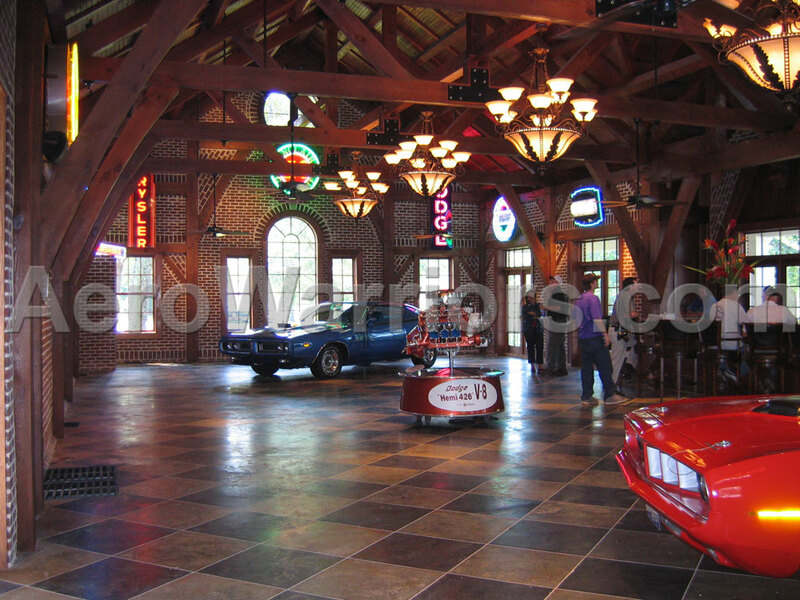 Yes, this is just one of the Wellborn garages! 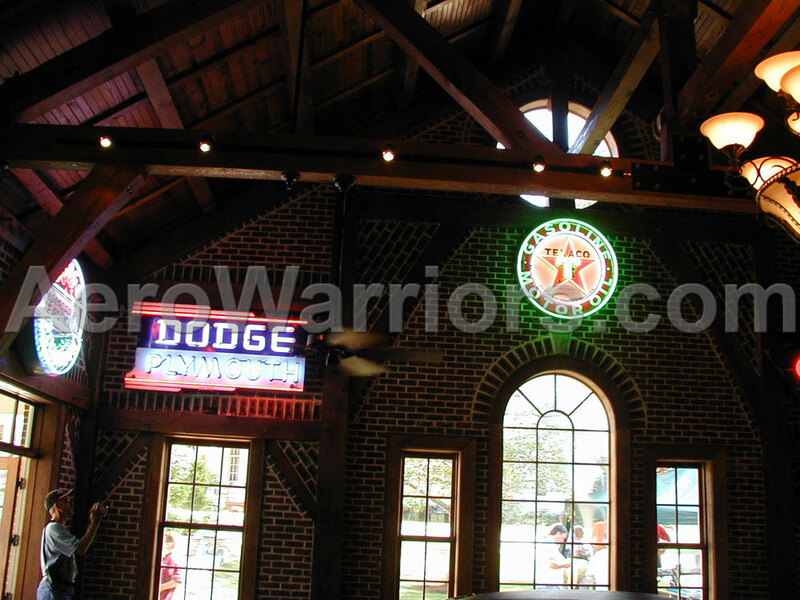 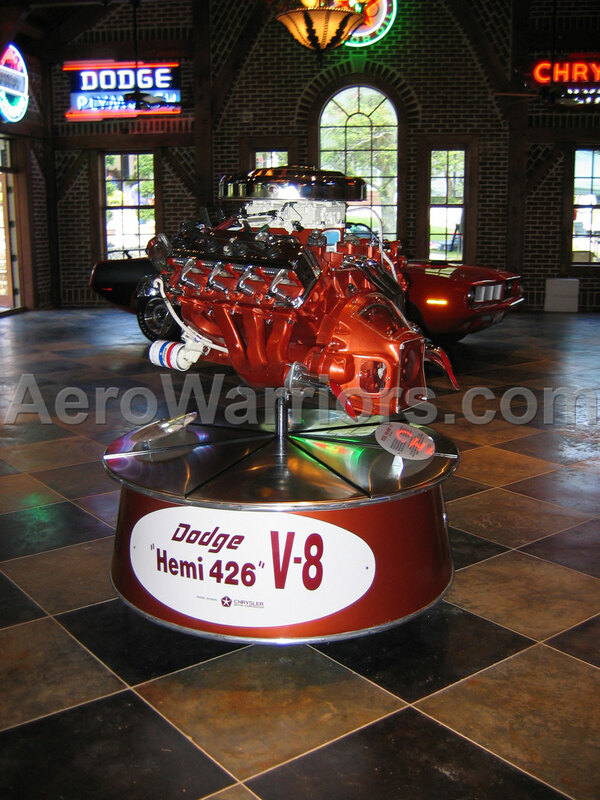 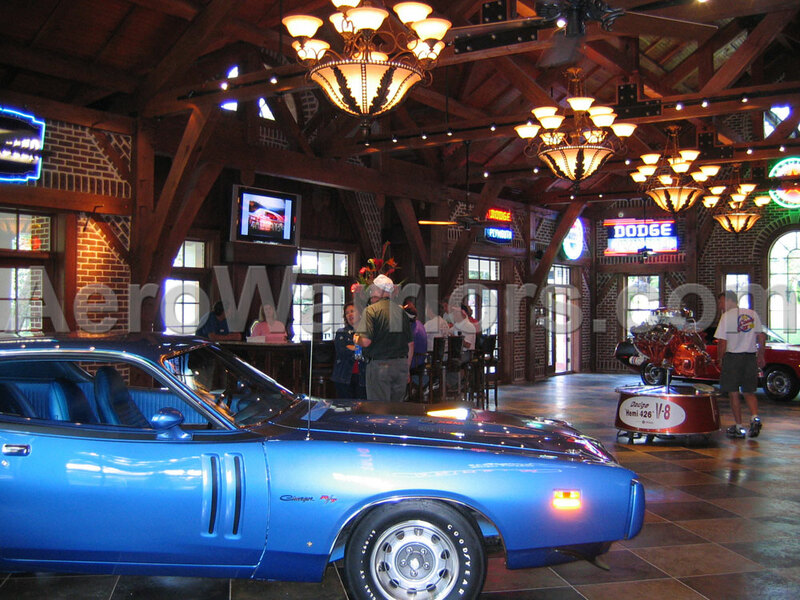 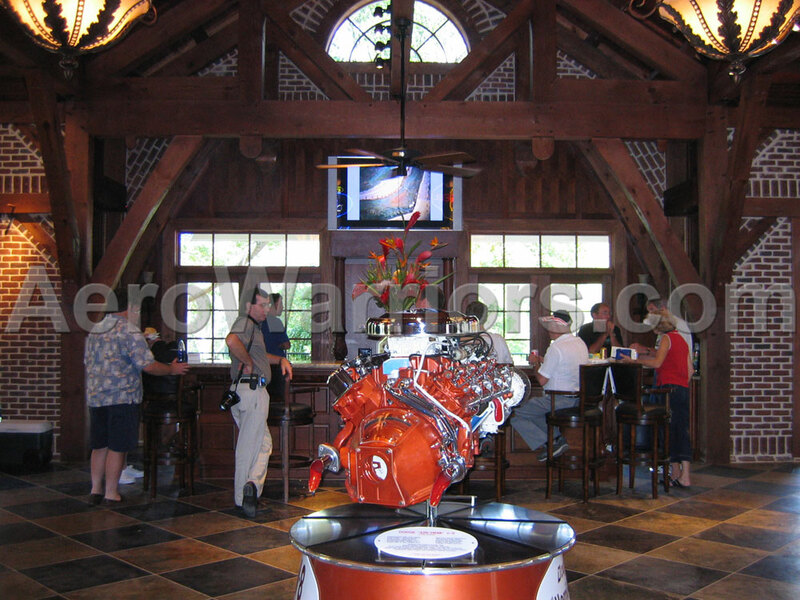 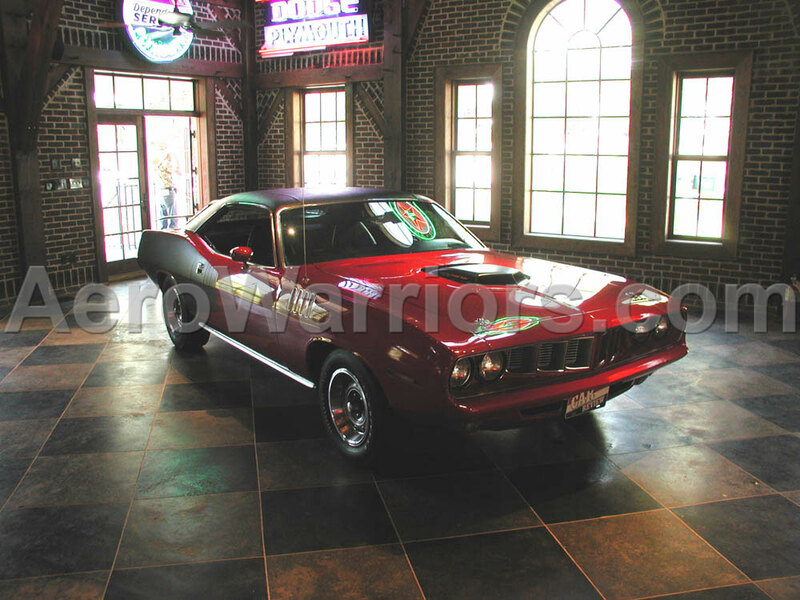 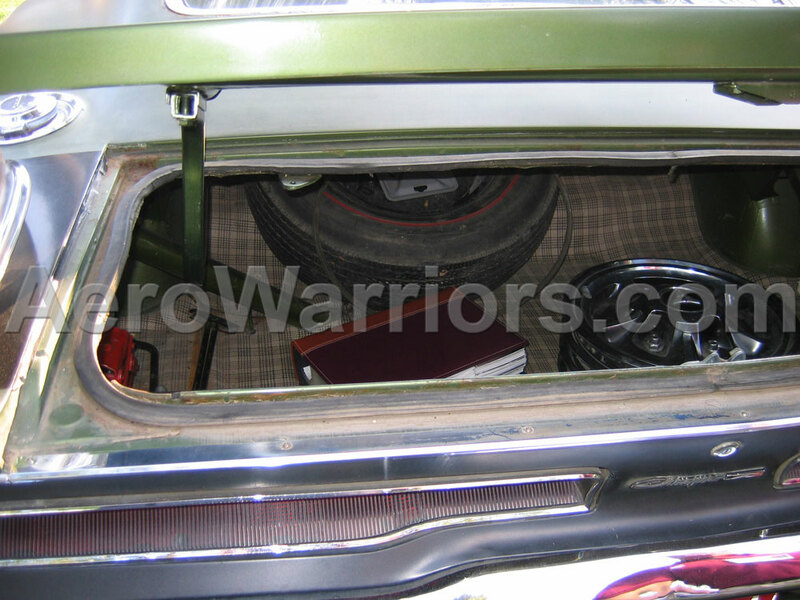 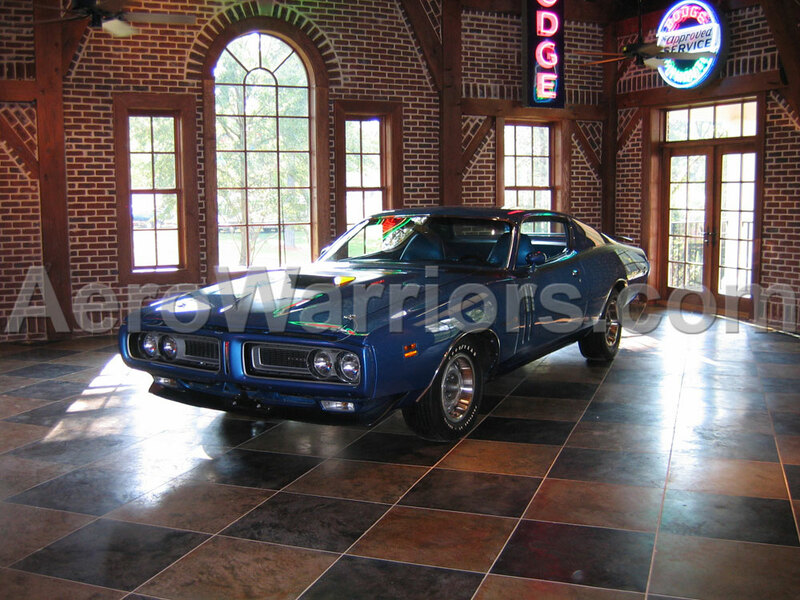 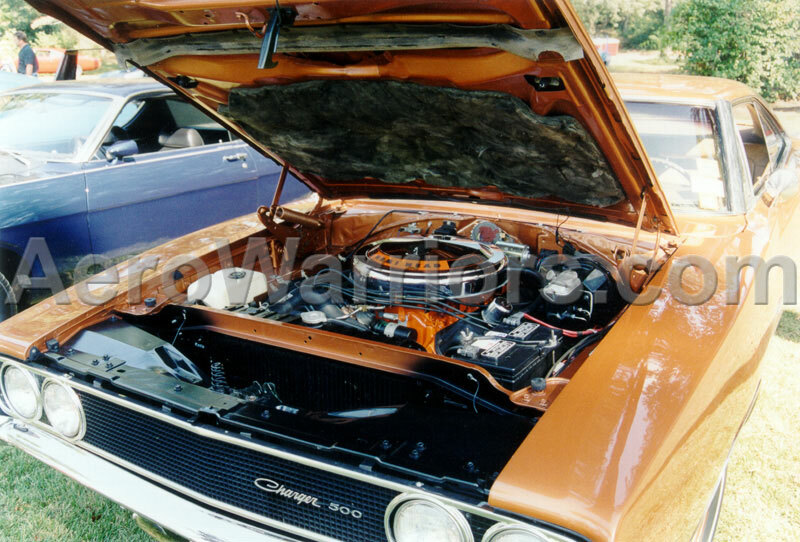 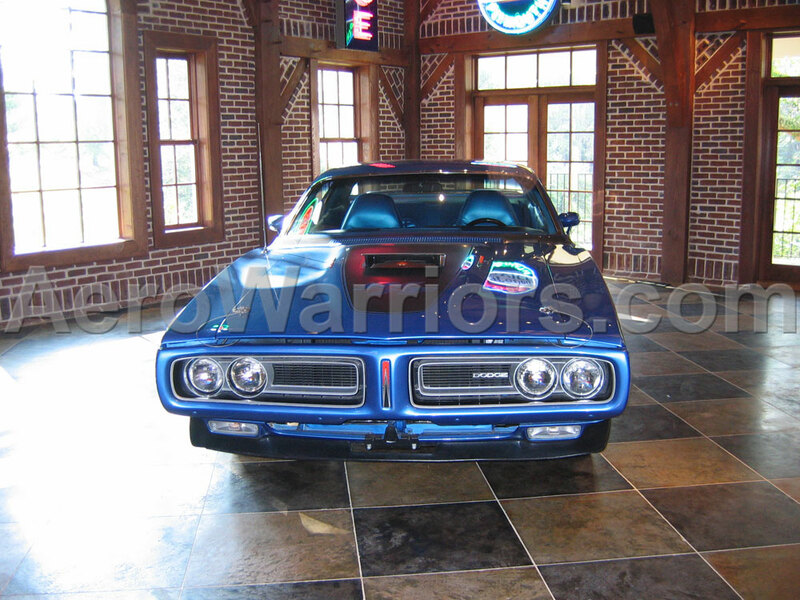 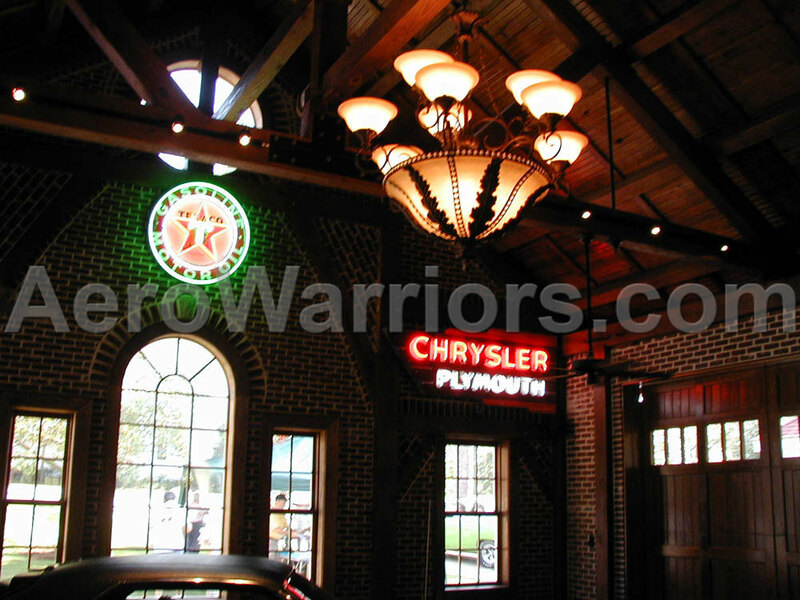 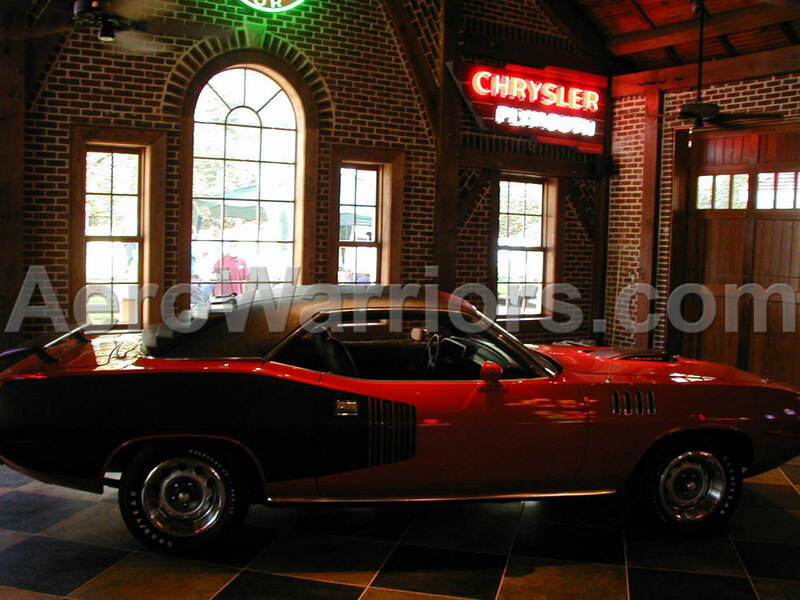 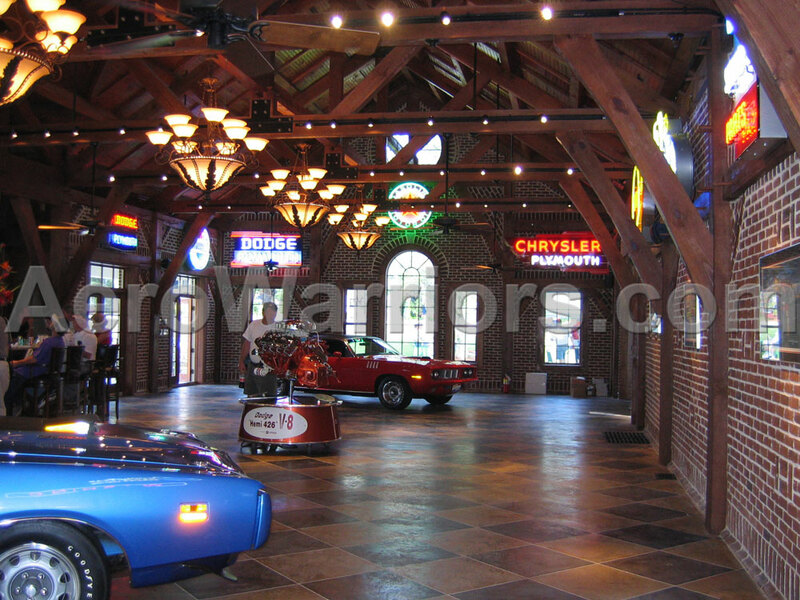 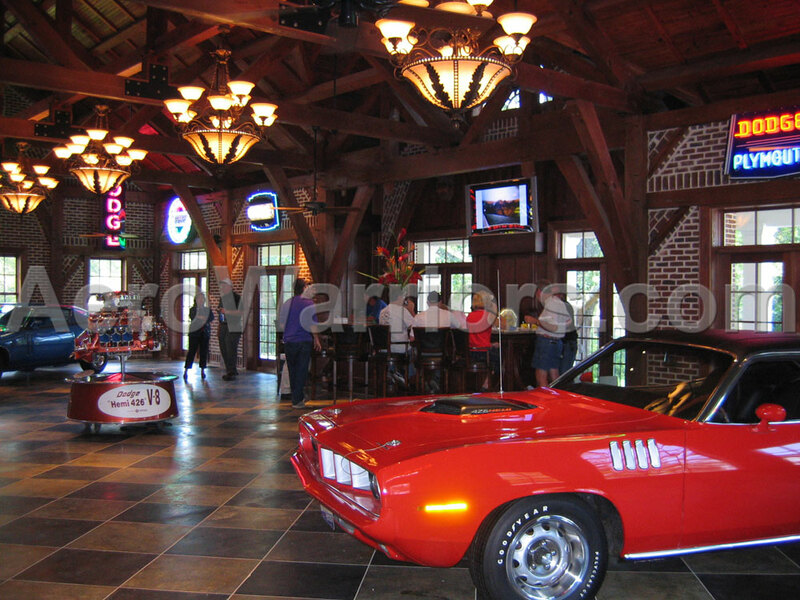 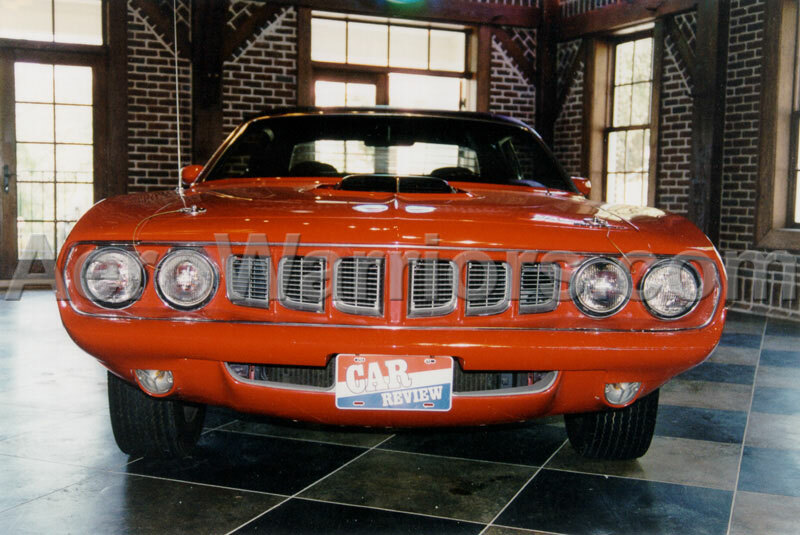 For those tired of looking at the Hemi cars and cut-away, you could saddle up to the bar and watch some televison. 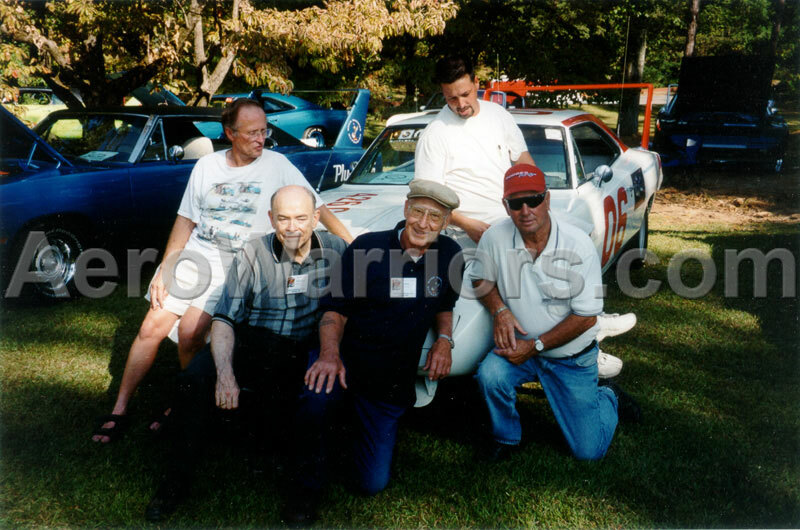 Center of photo from left: Chrysler engineer George Wallace, racing boss Larry Rathgeb and driver Charlie Glotzbach. 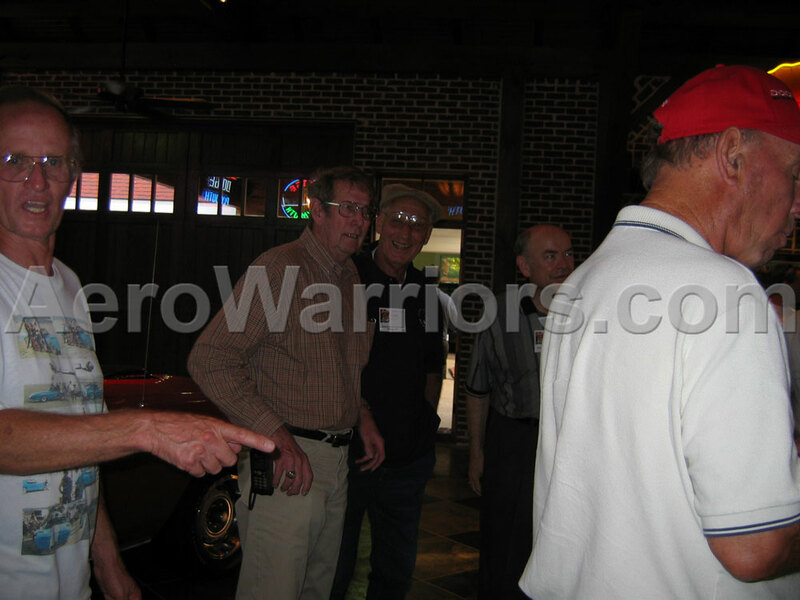 Center of photo from left: Driver Charlie Glotzbach, Chrysler engineer George Wallace and racing boss Larry Rathgeb. 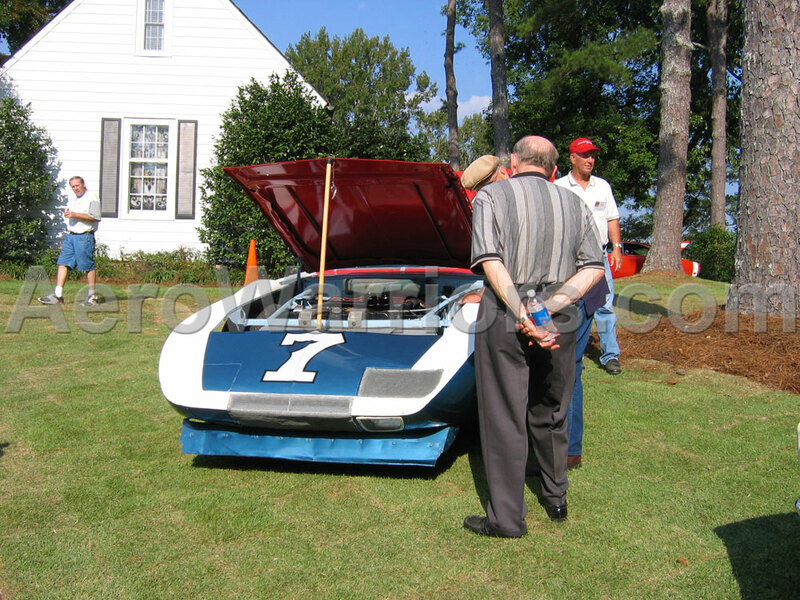 Ford racing boss Charlie Gray tries out the #17 Pearson Ford. 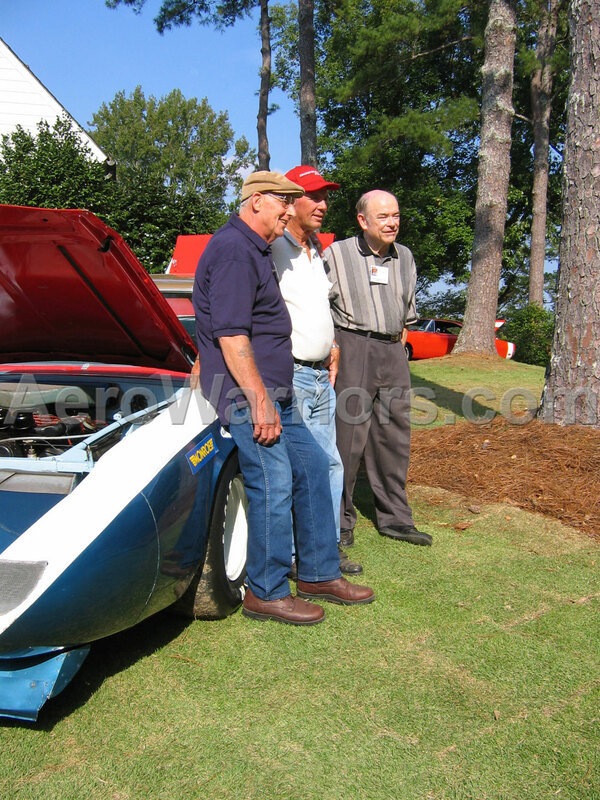 From left to right: Larry Rathgeb, Charlie Glotzbach and George Wallace with the #7 Ramo Stott SuperBird. 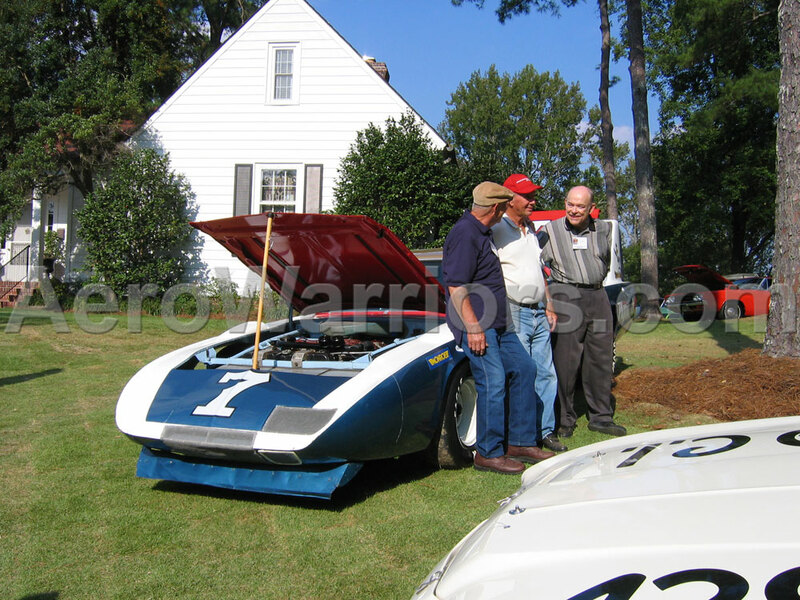 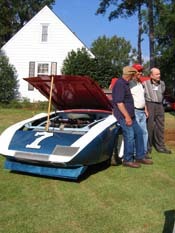 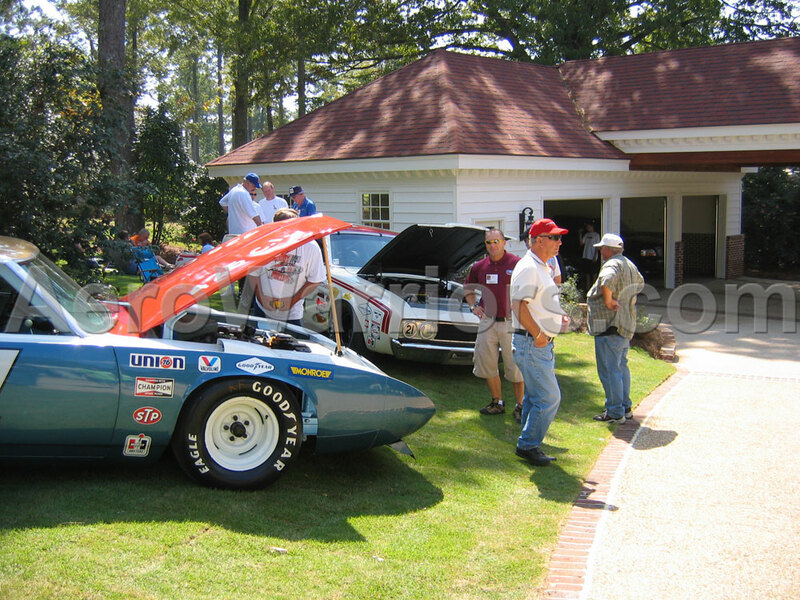 From left to right: Larry Rathgeb, Charlie Glotzbach and Geroge Wallace with the #7 Ramo Stott SuperBird. 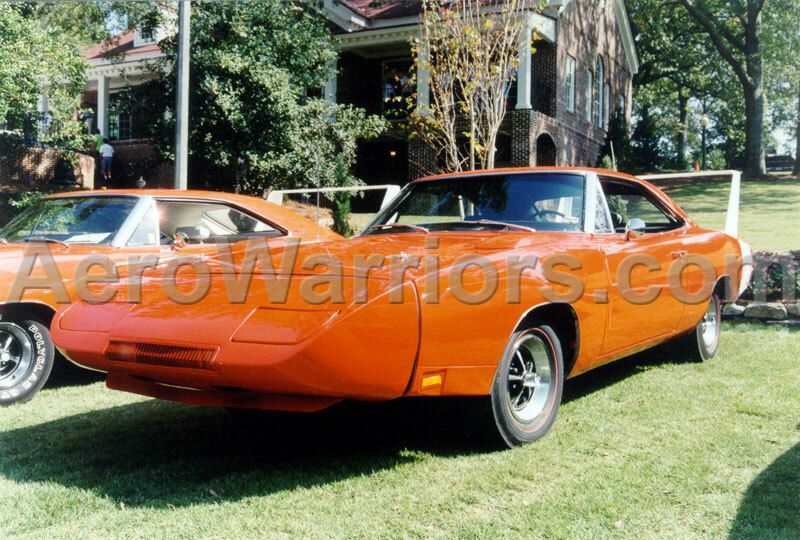 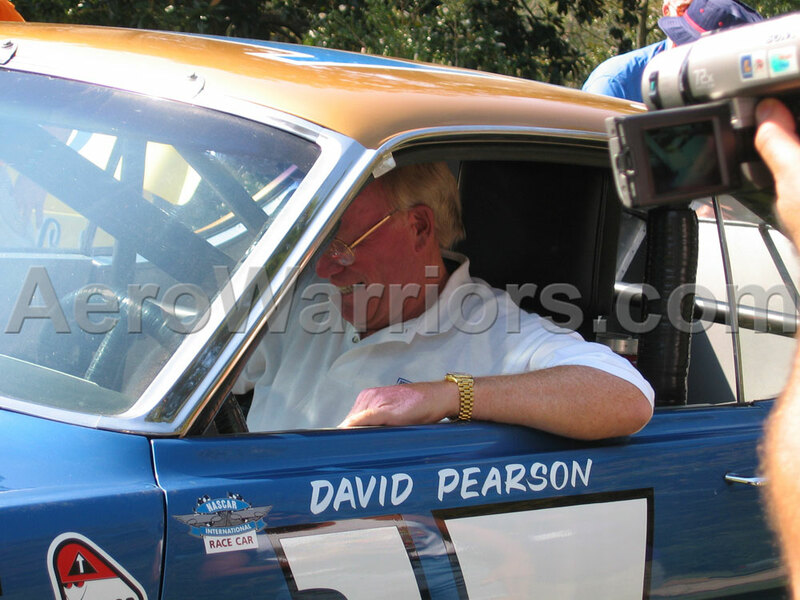 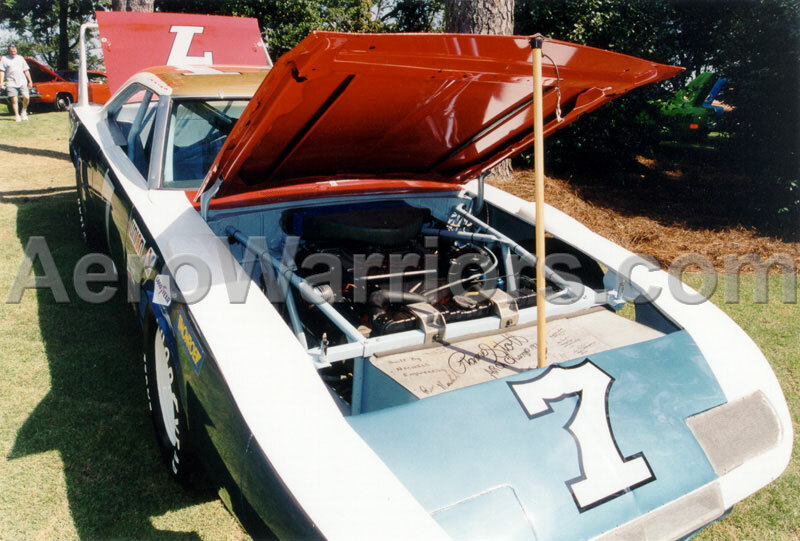 Dodge Charger Daytona driver Neil "Soapy" Castles with the #7 Ramo Stott SuperBird.